Once in a while I hear from blog followers who are interested in the BeNew weight loss program I’m on. 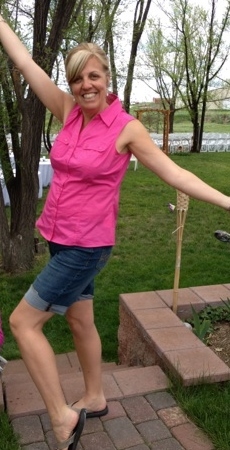 My hubby just told me he is offering free shipping on the weight loss products through noon (MST) on Monday. If you’ve considered trying them, ordering today would save you some $$. He’s on the verge of rank advancement in Life Force and would love to see it happen tomorrow, so I thought I’d post this as a way of cheering him on. For this special offer you have to contact him directly instead of going through the website. Call or text him at 720-323-4381 or email him at lifeforce2k@gmail.com. Opportunity for free s/h on BeNew! I just might frame that piece of paper. Yesterday Jerry and I worked a vendor’s fair telling people about the products I’ve taken to get healthy and lose weight. A vendor representing a fitness club had one of those machines I typically avoid like the plague. Only today I got on it. 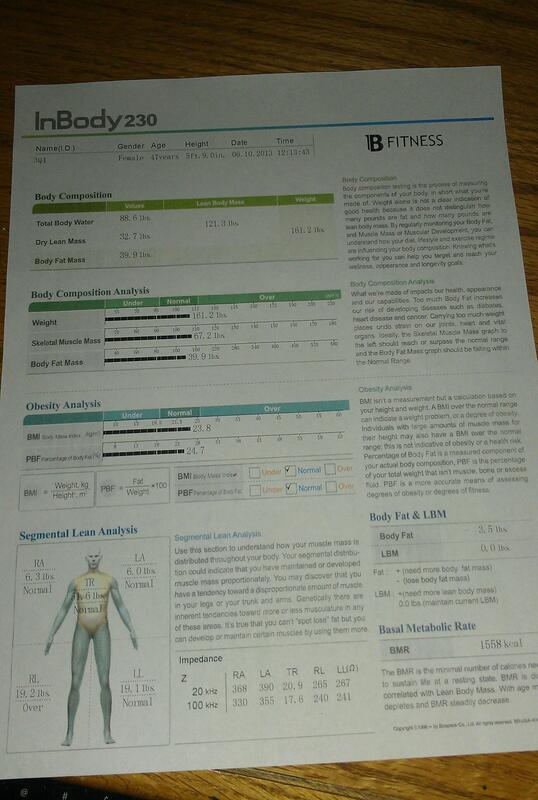 It measured my body composition–you know stuff like hydration, skeletal muscle mass, weight . . . BODY FAT. But here is the amazing part. When she looked at my body fat mass she told me I needed to drop 3.5 pounds of body fat. This to the woman who weighed 210 last October?? To the one who stared at almost 60 extra pounds when she looked in the mirror? It confirmed what I’d been feeling, that I had about 5 pounds to go. I can barely believe it! If you’ve been around here you know I haven’t been perfect on this journey. That I’ve struggled through the ups and downs most overweight people do. But today’s little piece of paper reminded me that change IS possible. It truly has happened and continues to happen for me. If you know me, you know I’m not a hard sell kind of person. But let me say it straight this time. If you have been waffling about trying the BENew Weight Loss program, don’t wait. You don’t have to keep struggling. You don’t have to wonder if you can experience change. This can happen for you, too. There are a few things in life I wish I could give to everyone I care about, a few things where my passion bubbles inside all of the time. One is a deep understanding of the full, total and unconditional love of Jesus Christ and God the Father. The second is the joy of emotional, spiritual, and relational health. And in the last six months the third has become the freedom of getting your life back after obesity. I want these things for you, my friend. Love, joy, and freedom. Believe you can find it. Pray for it. Stand firm in your choice for change. Don’t give up hope. Don’t quit. Seek to be new, inside and out. It can happen for you, too! Simple, no cost, no maintenance pleasure. If you’re on a journey to better health, you’ve been told to drink more water. Let’s face it. As fabulous as cool, clear water is, it can become a task instead of a pleasure to get the amount you need. There are lots of wonderful recipes out there to add a little pizzazz to your water. Mine isn’t anything new, but it feels extra special to me because it comes straight from my yard, to my refrigerator, to my glass. A couple of summers ago I purchased a small lavender plant. 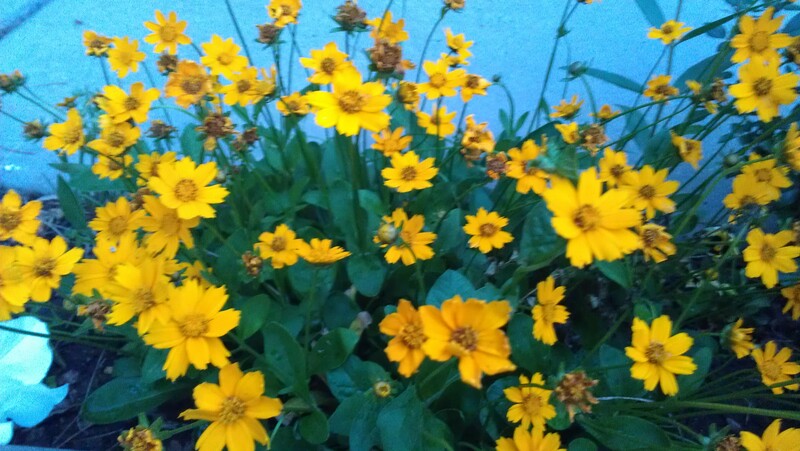 A friend told me it was hardy, easy to grow, and had lots of uses. 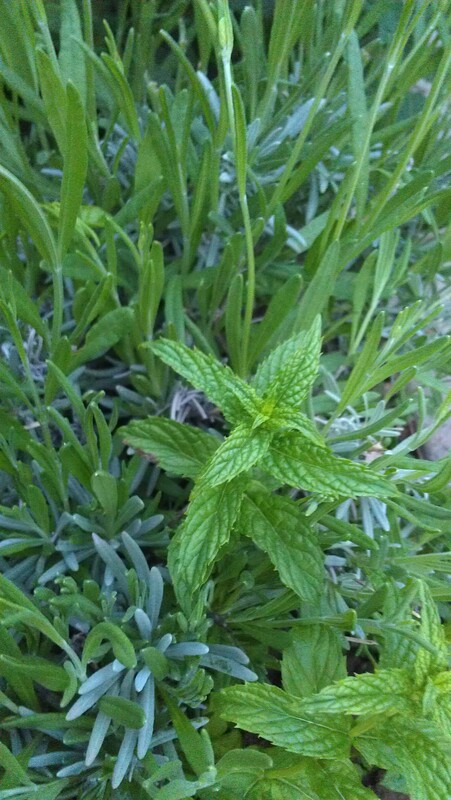 Last summer a friend shared a few of her mint plants with me. 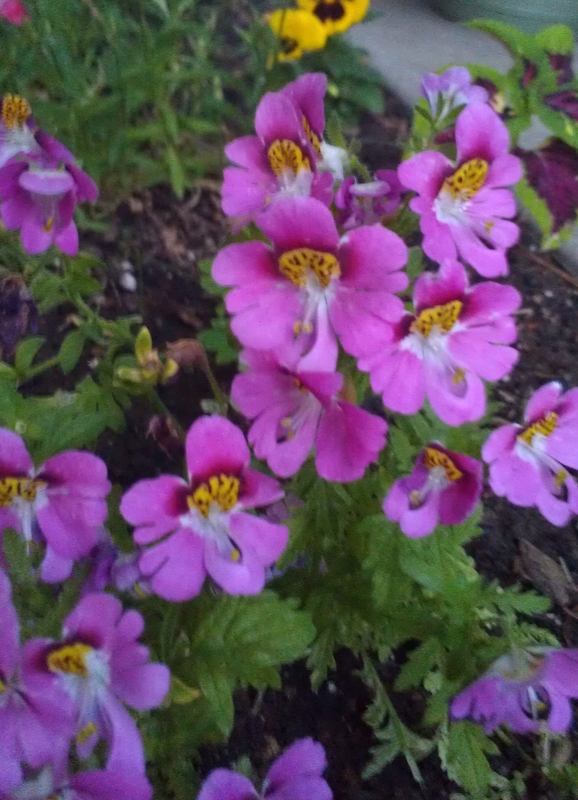 I threw them in the ground next to the lavender, no extra care, and they grew. This summer I’m harvesting. (I did last summer, too. You can harvest right away.) It’s very simple. I break a few leaves off, rise them, and toss them in a pitcher of water. I cover the pitcher and let it sit overnight in the refrigerator. The next day I have gently flavored (and scented) water to drink. I add water a few times a day so the pitcher never runs dry. 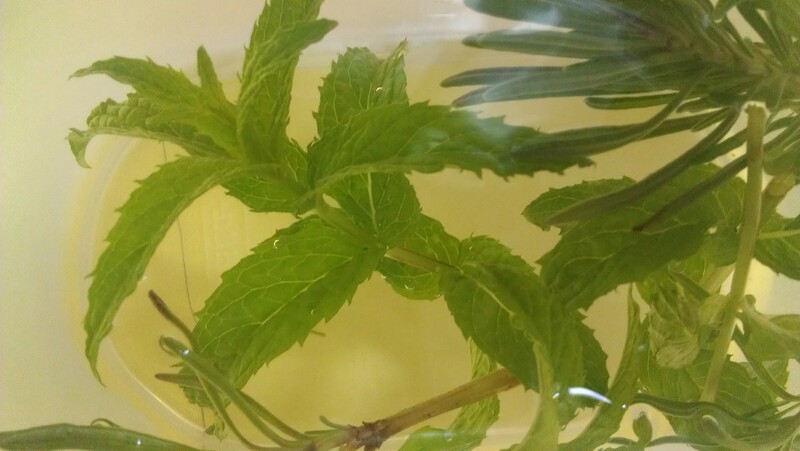 My mint and lavender leaves last 4-5 days before I decide they aren’t as potent as they were initially and need to be replaced. I just consumed roughly 12 ounces of water as I typed this post. Each sip brought pleasure as a gentle whiff of lavender scented the air as I drank. Of course you could have mint water or lavender water. You don’t have to do both at once, though I prefer it. 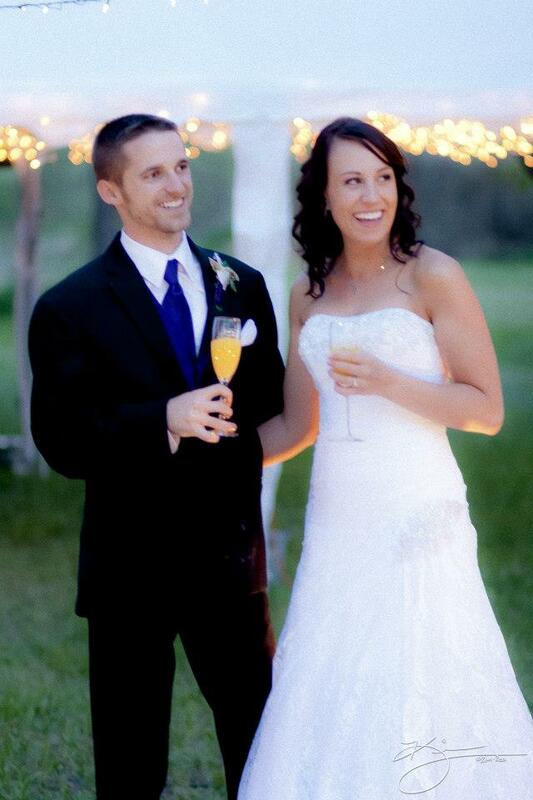 And just as aside, we served up fancy waters at Sarah’s wedding a few weeks ago. I love it that something as basic and healthy as water can become special with so little effort. 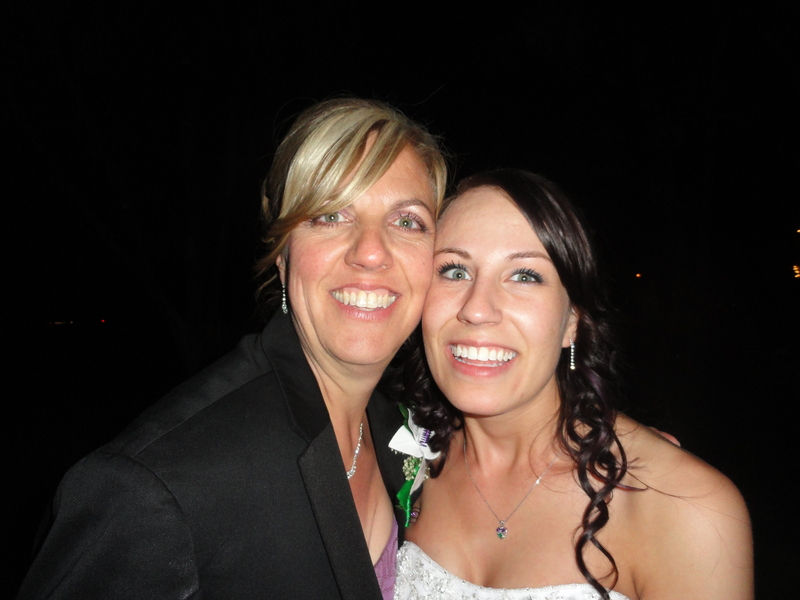 I wanted to write a profound post this first entry after my series about my daughter’s wedding. 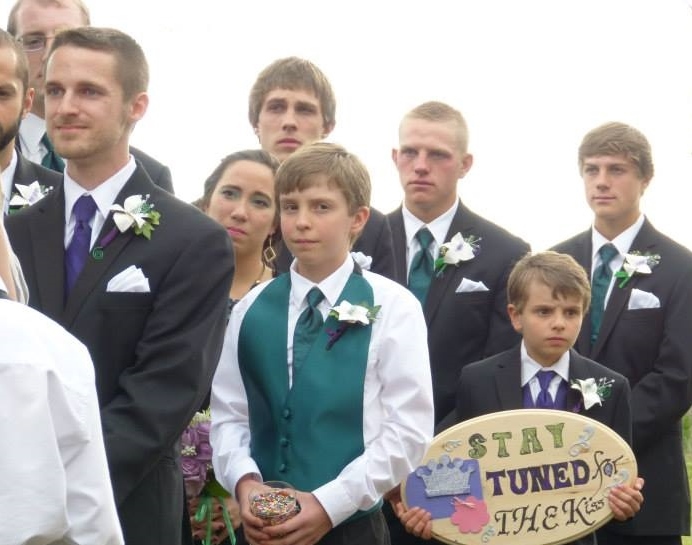 Guess I wasn’t really up to digging deep this time, but here’s what I’m thinking: Life isn’t usually about the big, impacting stuff–like weddings. Enjoying life is often about the simple moments, the tiny pleasures. Lavender leaves in water. A walk with someone you love. A brief pause in the rushing to enjoy the beauty right in your own yard. Here’s a bit of what I savored in my pause this evening, right before Jerry and I sauntered through the neighborhood, holding hands in the falling dusk. My mailbox. You can’t tell in this picture, but it is yellow, one of my favorite colors. My sister-in-law painted it as a surprise to cheer me up during a gloomy season. 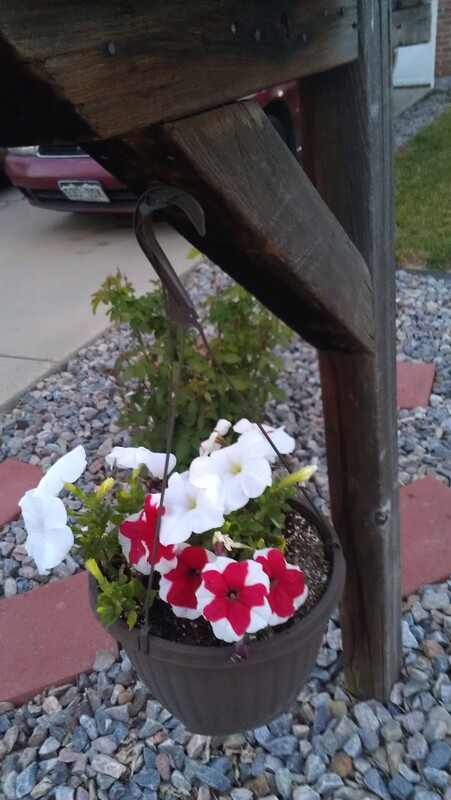 This year I planted red and white flowers beneath it to honor my neighbor, who hates yellow and has threatened to paint my mailbox red! My other favorite color is pink. 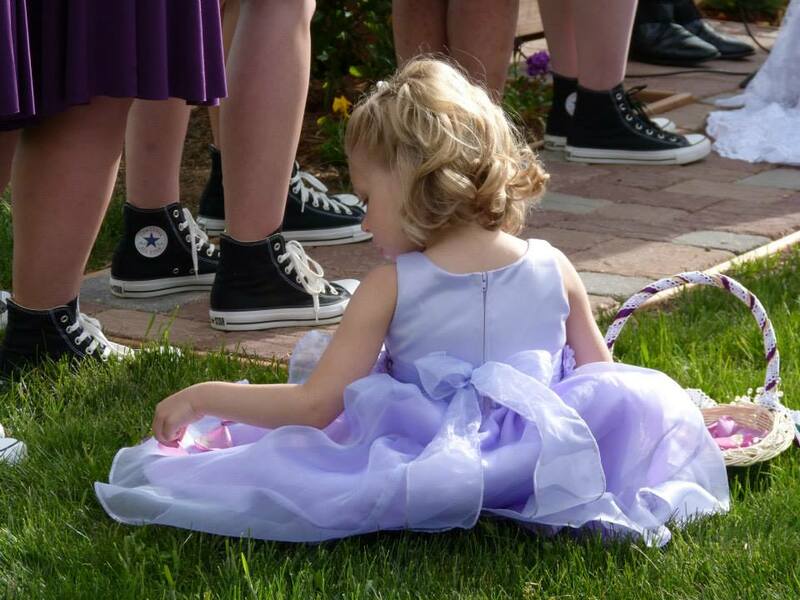 (Though since Sarah’s wedding I’ve become partial once again to purple, which was my favorite color in childhood.) I’m especially enjoying this unique flower this year. I love its cheery yellow face, so pretty framed in pink! It’s also cool how the yellow is outlined in purplish magenta. Drinking the water you need can be a simple pleasure. Maybe I’m just not ready to let go. 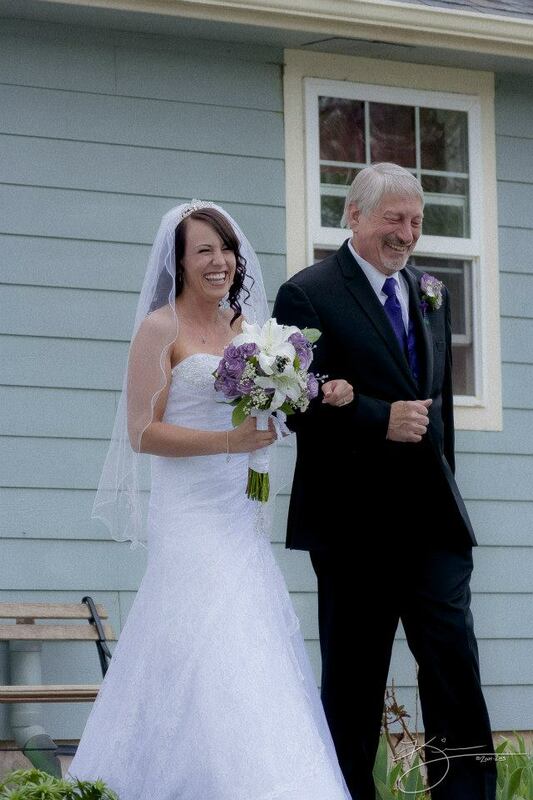 To write the last wedding post is to move on from the big day and into the reality that my daughter is a married woman. That she and David are now their own family. My excuse is that I’ve been busy transitioning, painting Sarah’s old room lime green and black so her youngest brother could have his own room for the first time in his life. Honestly, I could have found time to write this post. But to write it is to place “the end” on one of the most beautiful days of my life. 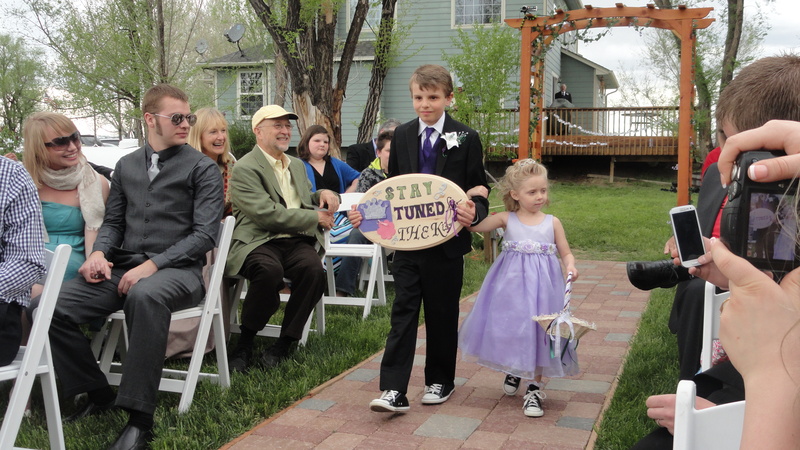 It really was a joyful time, a true celebration of all the beauty, hope, passion, and wonder of the new life that began with the ceremony I wrote about last time. 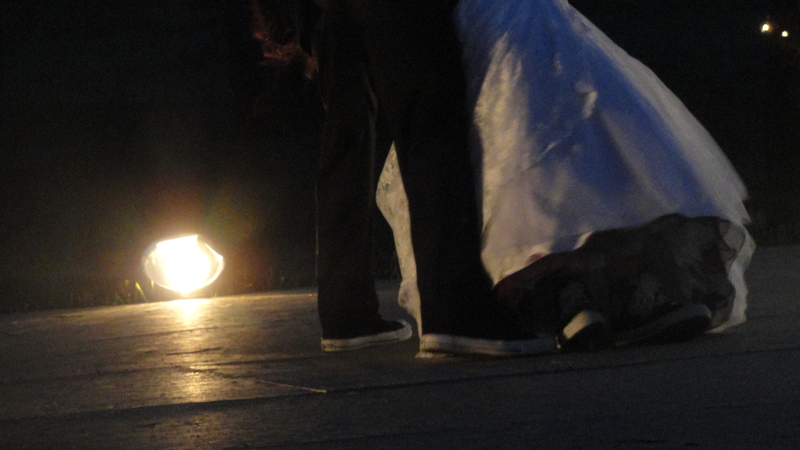 After the final prayer and their first kiss and man and wife, Sarah and David skipped (literally) down the sidewalk. It was time to party. 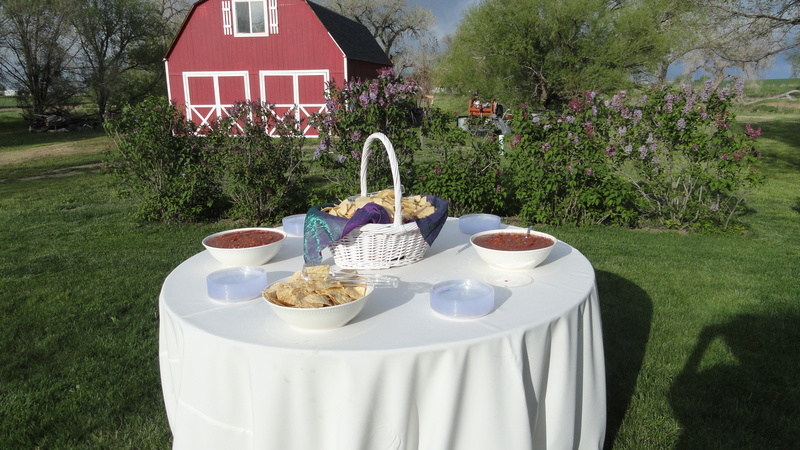 The guest enjoyed chips and salsa and the “fun table” activities Sarah had prepared while the family took pictures. 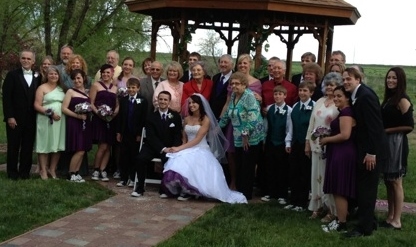 Although I’m becoming as bad as a new grandma at subjecting people to wedding pictures, I’ll just show you one of both sides of the family all piled in together and spare you all the other family pictures I itch to post. Then it was time to enjoy a wonderful meal of Italian food. 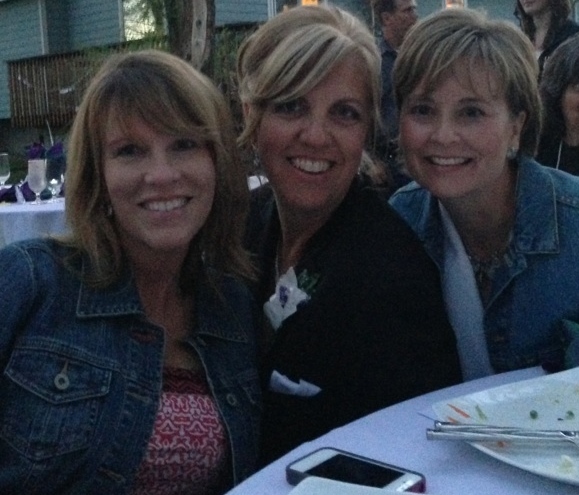 A fun surprise is that the caterer’s sister is a dear woman in Sarah’s life, but was unable to attend. She sent a special little love message to Sarah in the form of Sarah’s favorite Miss Maggie dish, macaroni and cheese! What’s funny is that dish went first, before all the fancier dishes offered! 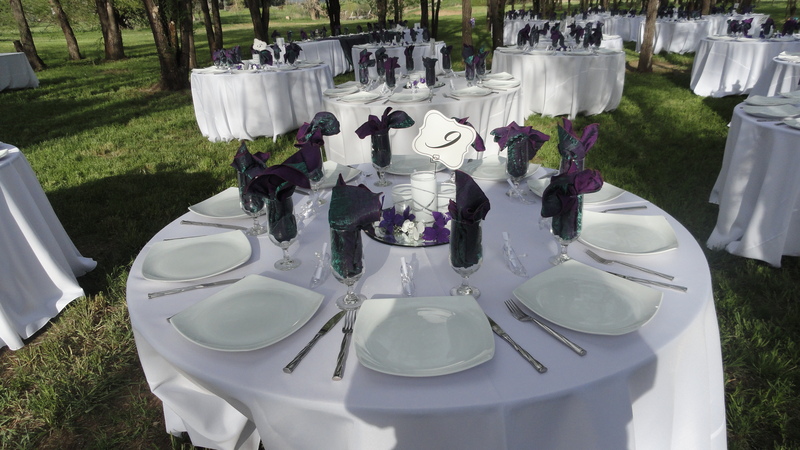 The tables looked beautiful, all Sarah had planned and worked to create. 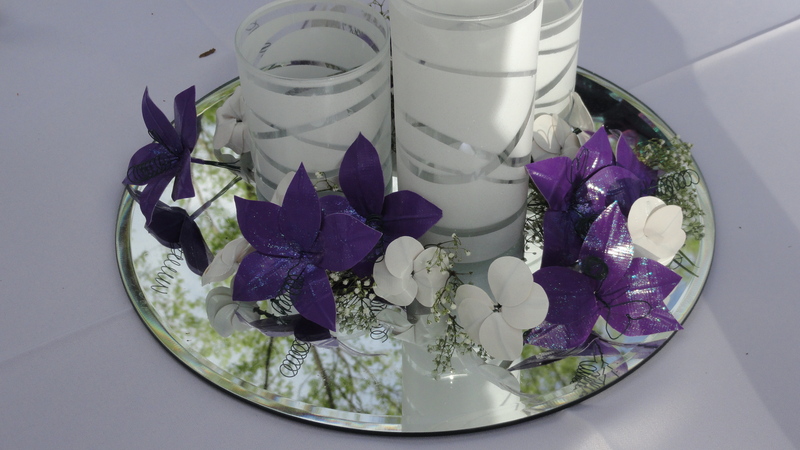 Minus the napkin ring holders we couldn’t find at set-up time. 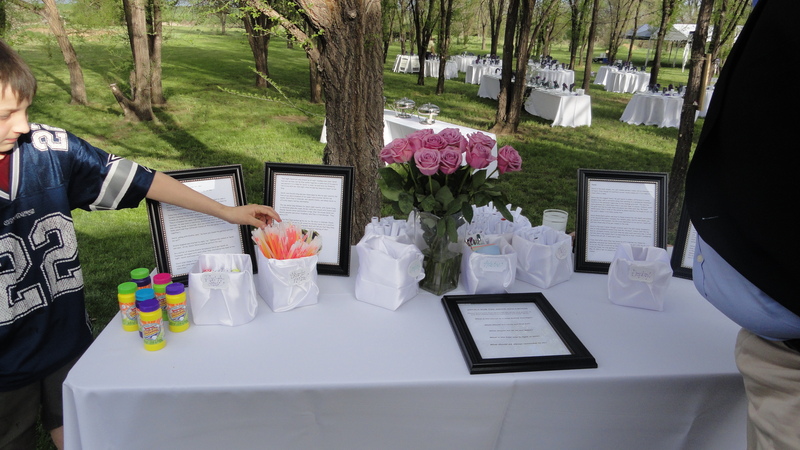 My friend Deb, my sister-in-law, Anne, and I probably had 15 or 20 collective hours in the making of those napkin rings, but hey, if that is the biggest confusion of the wedding, who cares! Maybe Sarah can make some money on Esty! Of course one of the especially fun parts of the dinner hour was that while Sarah and David wandered around greeting their guests, they had to pause often to kiss because the guests kept clinking their goblets. 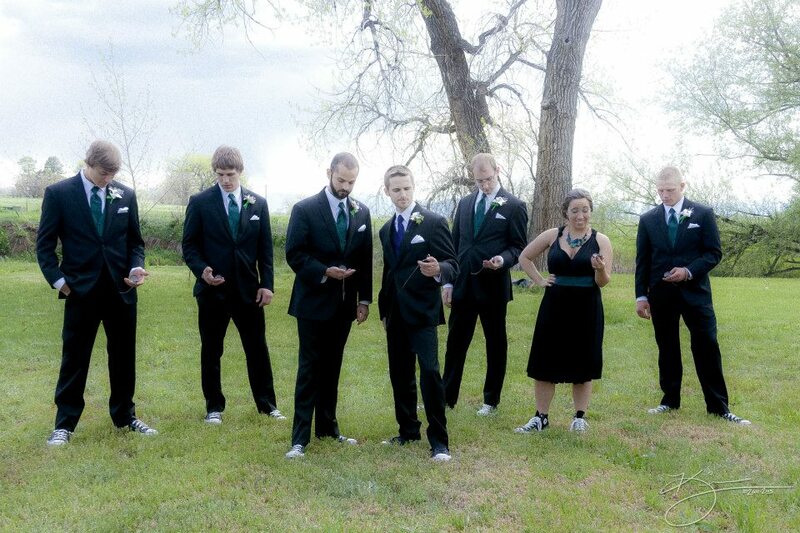 I love that old tradition, which I’d never experience until a couple of weeks after my own wedding. Jerry and I attended a huge family reunion full of people I didn’t know but who knew me because their cousin/nephew/great-nephew (you get the picture) had FINALLY been snagged. 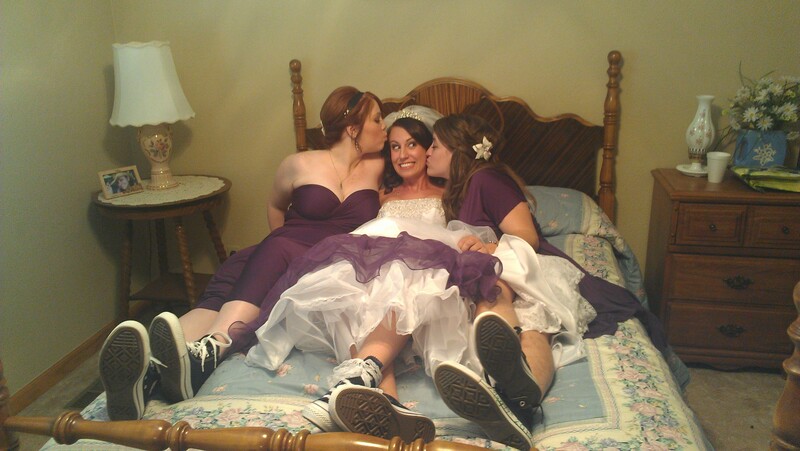 Since we were the newest married couple we kissed a LOT that night. 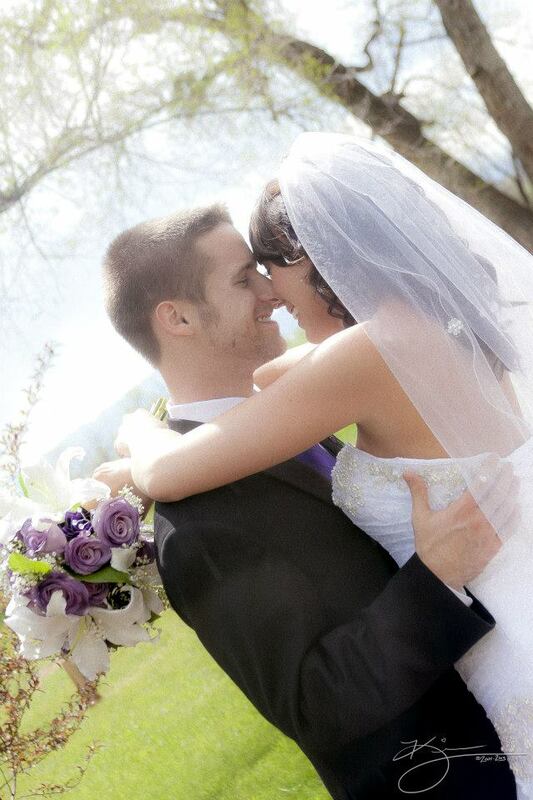 As did Sarah and David on their special day. As we enjoyed our meal, the sun sank in the sky. It hovered on the horizon during the toast. 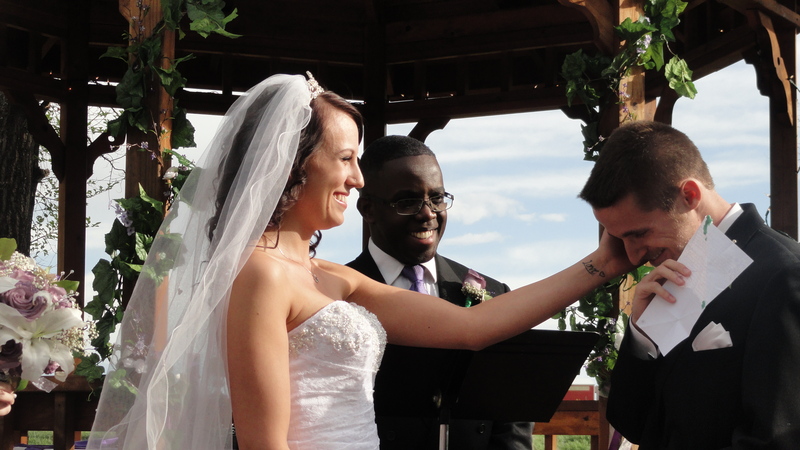 Bryan, Ashley, and Jennie did an amazing job of honoring the couple. 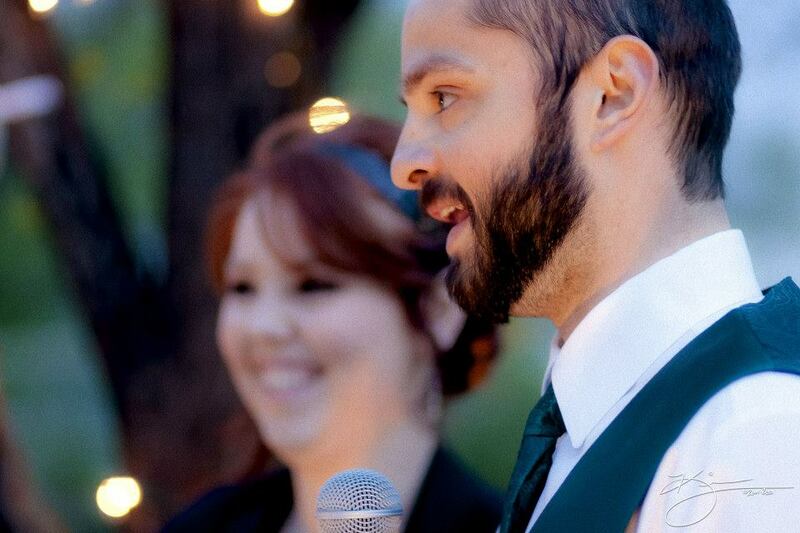 Ashley and Bryan made us first laugh, then fight the inevitable lump in our throats, then Jennie gave David the highest of compliments, declaring him even better than Mr. Darcy of Pride and Prejudice. She went on to say said Sarah was the only person she knew who could capture the beauty of their childhood fairy tales and take them into this real-life world. Jennie ended by toasting her “real-life hero and heroine.” I guess she and I had the same idea with the whole real-life fairy tale motif. 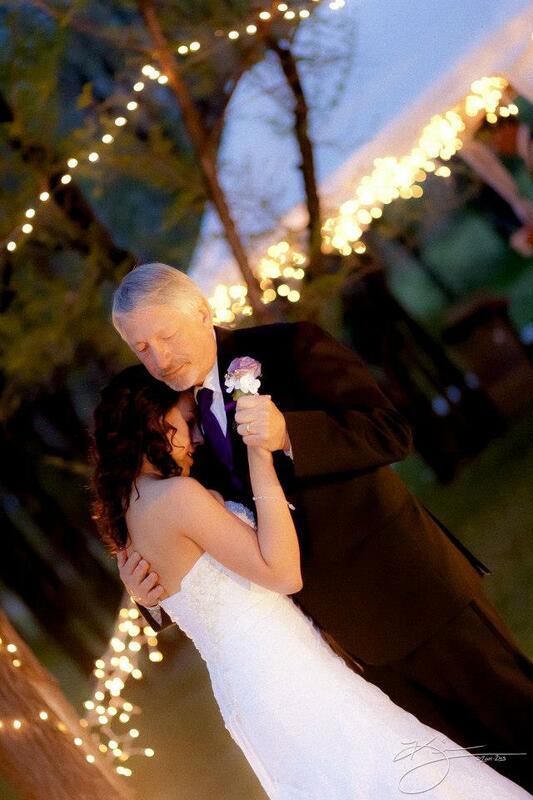 The blue above them deepened as the twinkle lights shimmered, and Sarah and her daddy danced. 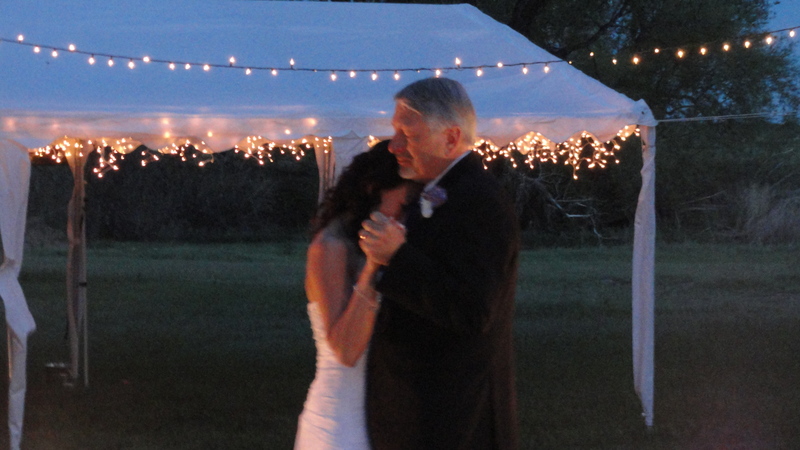 It was time for Sarah and David’s first dance as man and wife. 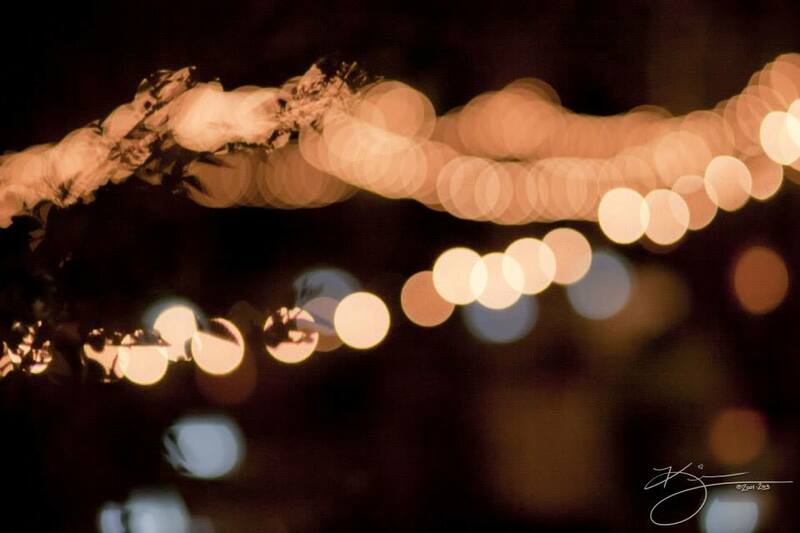 The sky had drawn its night curtain and tiny diamonds began to sparkle on black velvet. 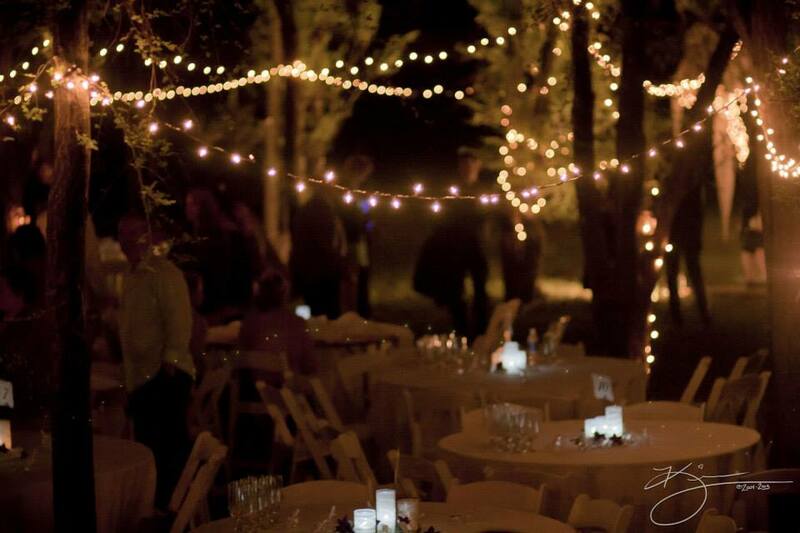 The stars showed up to witness the couple’s celebration and beam upon them, giving Sarah her dream to dance beneath their light. 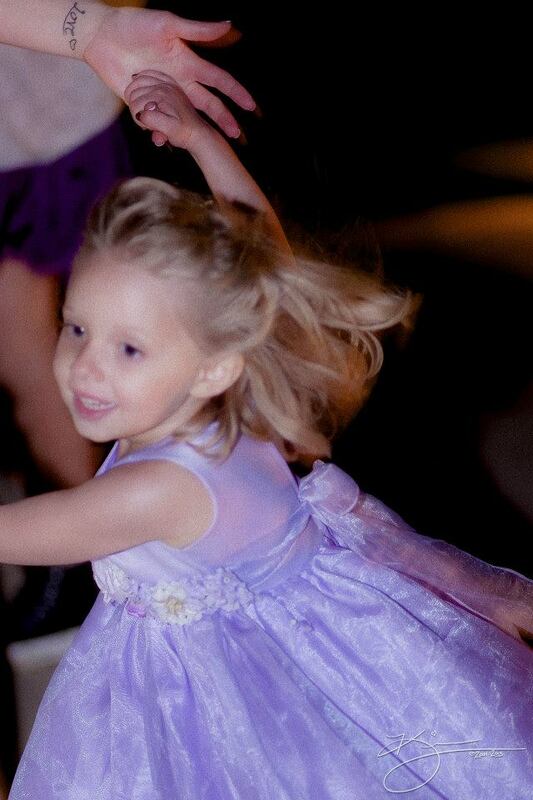 Sarah and David had practiced the dance for weeks, which always left my daughter giggling and excited to learn she could move without two left feet. 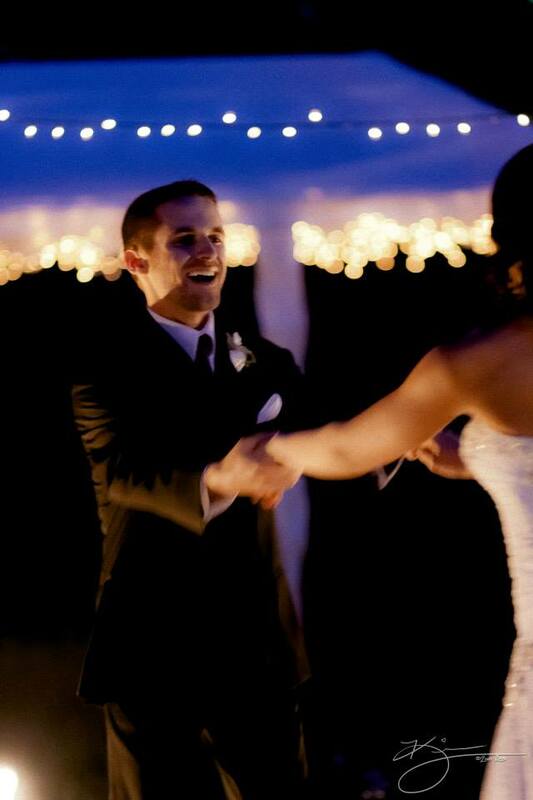 The delight of their first dance is forever etched in my mind. I’m grinning with a grin the size of Texas as I type this. 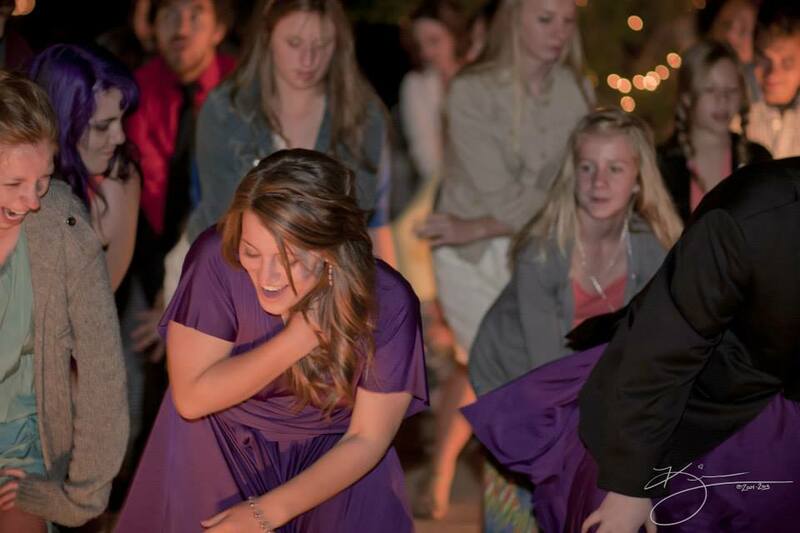 Soon the dance floor was full of young and old, graceful and not-so-much, and everyone had a great time. Magic joined the night dance. Her simple statement said it all. HE celebrated with us, infusing the night with joy unspeakable. 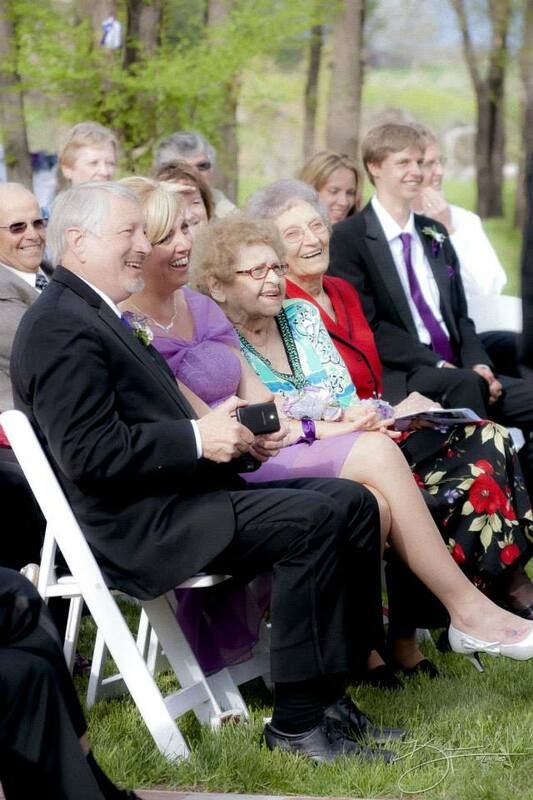 He pulled the couple together, surrounded them with a community of love, gave them this gift of lifetime partnership. And we all basked in His glory, shared with us that night. All too soon it was time to cut the cake. 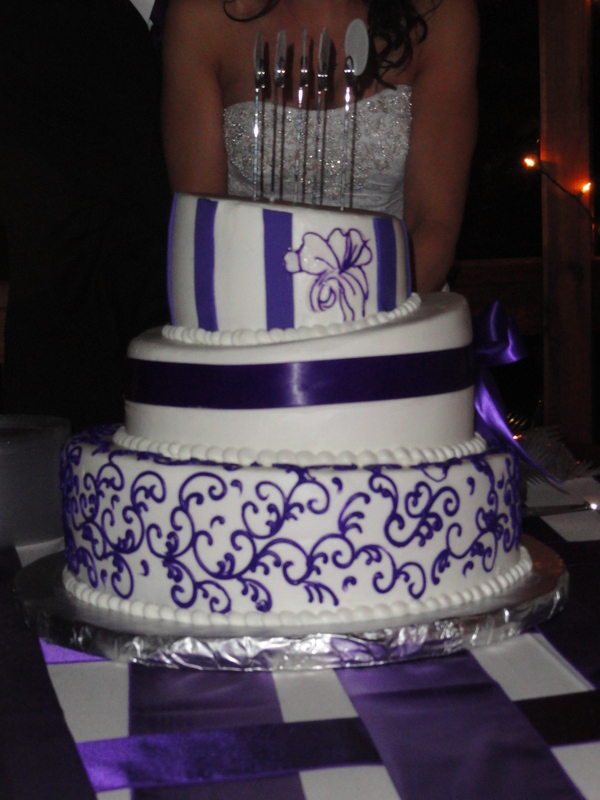 Standing sentinel across its top was a reminder of all God was teaching us in this celebration. 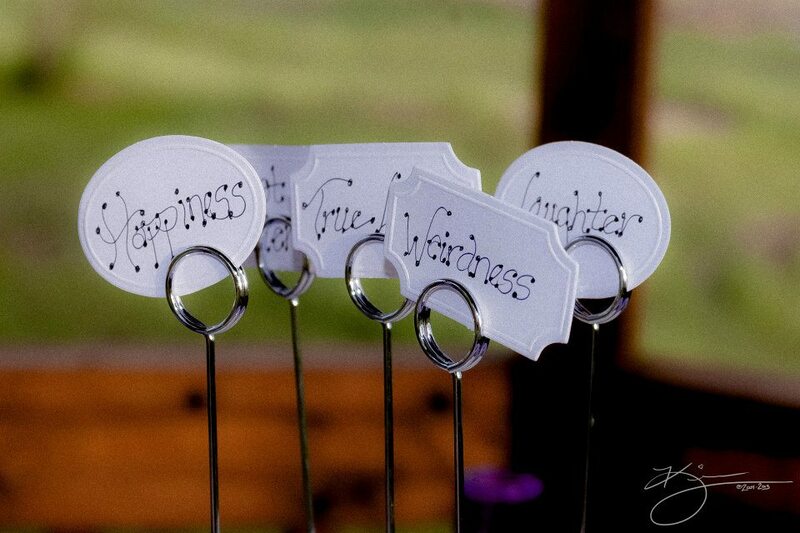 The words gracing it were hand-picked by the bride and groom, then hand-written by a friend. Another little touch of love, another reminder that provision was everywhere, community was irreplaceable, and His love, their love, and our love paramount. 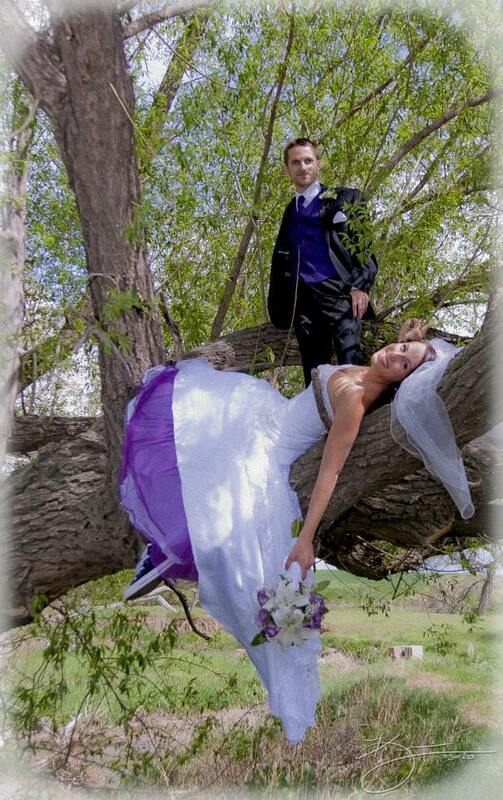 The big day was winding down, but not before the couple had a little fun. There was the search for the garter (which David’s sister, Kristina said made her blush), the bouquet toss, and one last dance. Soon the couple dashed through sparklers held by cheering guests and flew into the car, which had been appropriately adorned by the groomsman. The couple drove into the night, the obligatory tin cans rattling behind them. And now I must type, “the end.” It makes me cry. I don’t want to let the wonder go. 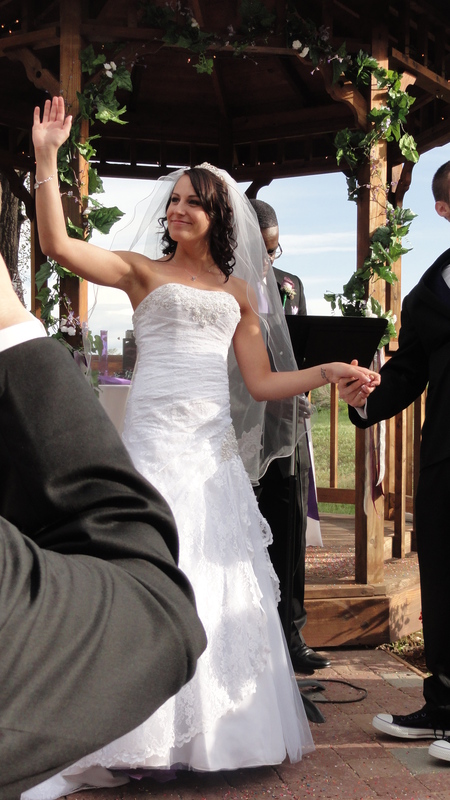 Congratulations, Mr. and Mrs. Grundy. We stand with you cheering on your union, confident in your new beginning and the One who gave it to you. 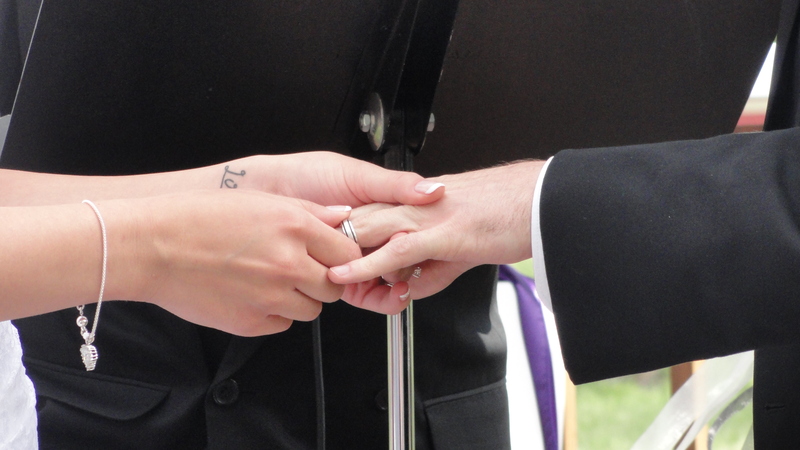 When I saw this picture I wasn’t exactly sure what it was, but as I pondered the imagery of three people’s hands, I came to believe it symbolized the verse from Ecclesiastes that Sarah asked to be written on the wedding program. For her, the triple-braided cord reminds her that she and David never stand alone, but their lives are entwined with the Holy Spirit, who is always with them and for them. When Sarah was very small there were a few prayers I prayed often: I prayed she would know and follow Jesus; be protected; and be given a good husband who loved her and who loved God. Sarah decided she wanted to follow God when she was very young. I think she was only four when she took her little brother aside and explained to him that Jesus died on the cross to pay for all the wrong stuff we’ve ever done and that Seth could chose to live in God’s forgiveness and God would come and live inside of him. She may have been three. As a teenager there were plenty of times of angst, lots of hurts and struggles. I watched as Scripture appeared on note cards all over the mirrors in her bedroom and bathroom, on sticky notes all over her room and books, was written on her door with sharpies, and (on particularly trying days) penned on her wrists and forearms. 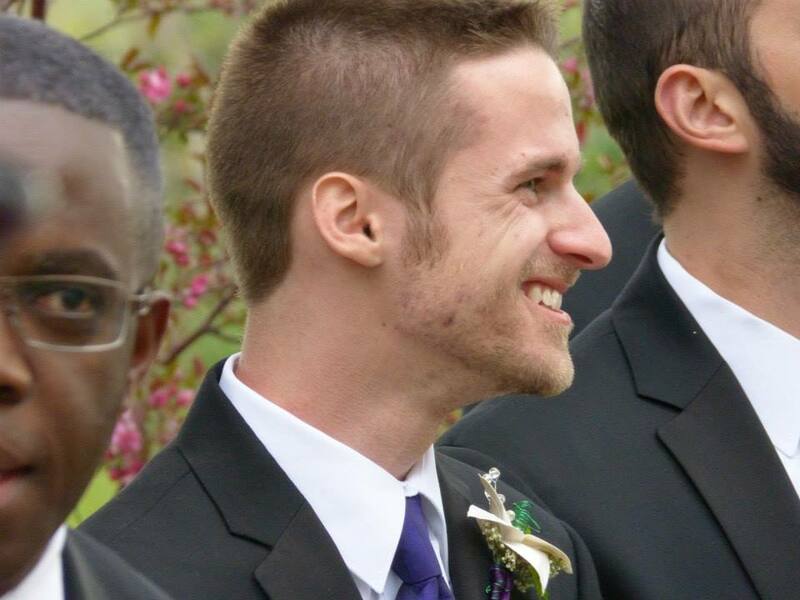 Far away in Georgia, David fought his own battles while his parents prayed and fought for him. And somehow they both grew up and loved Jesus. They had romantic relationships, and some were particularly painful. 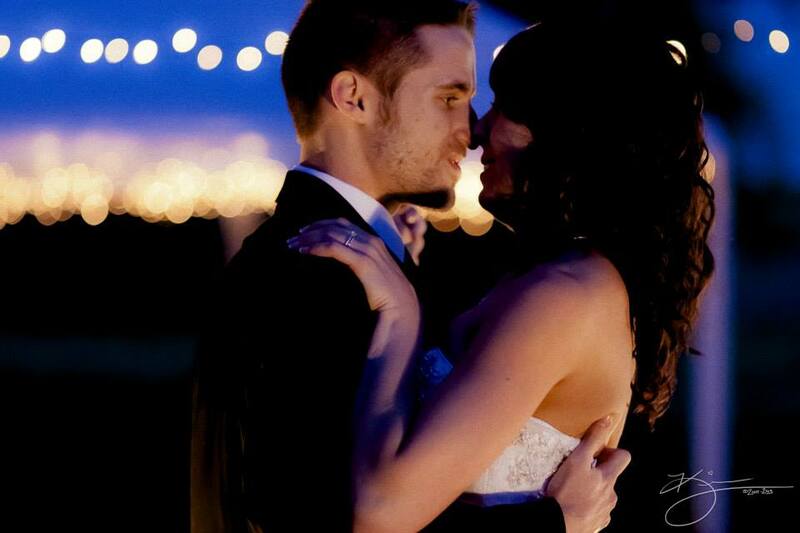 Then one day they both decided no more dating until it was obviously something God was doing in and for them. By this time David had graduated college in Illinois and moved to California. Sarah graduated cosmetology school and worked in Boulder, CO.
Kirsten started to reply, “no,” then gasped. “Sarah! 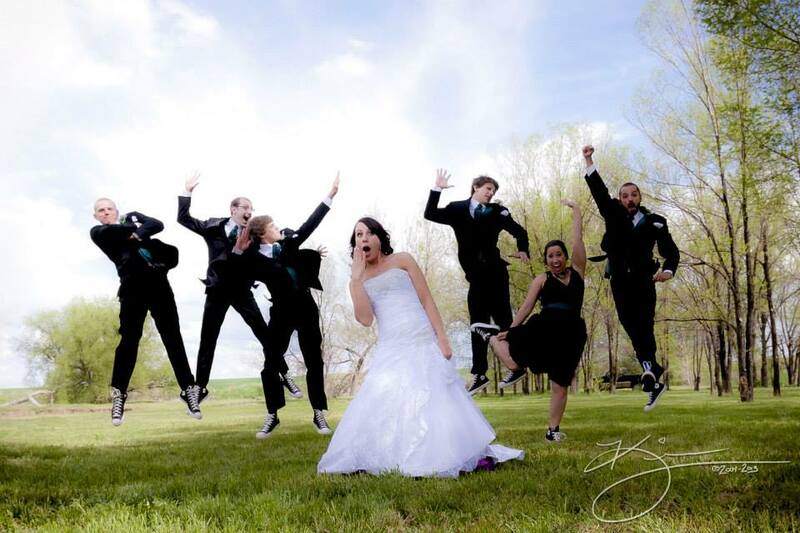 You’re perfect for David!” She introduced them on Facebook. They chatted most of the night. Sarah mentioned she had a blog. David stayed up all night, read every post, then put several of his poems on a blog for her to read. They will both tell you they knew that night they’d met their future mate. Fast forward roughly a year and a half to last June. 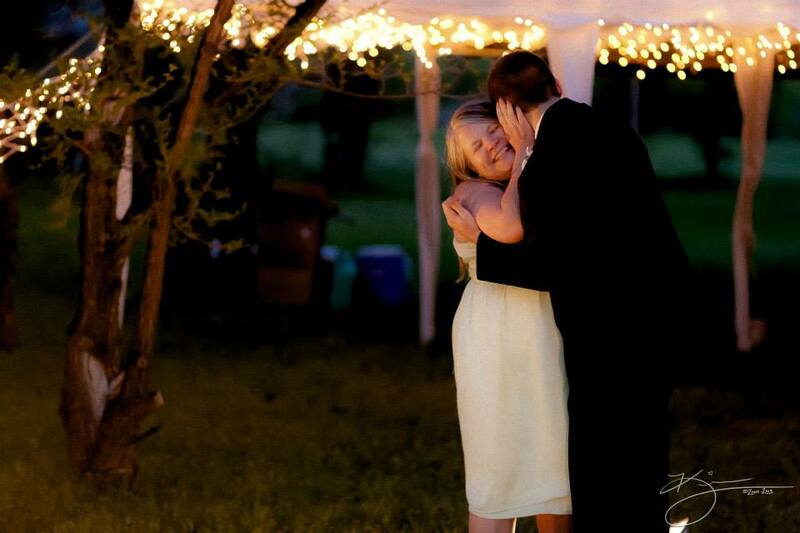 David proposed, and they picked May 19th as their wedding date. 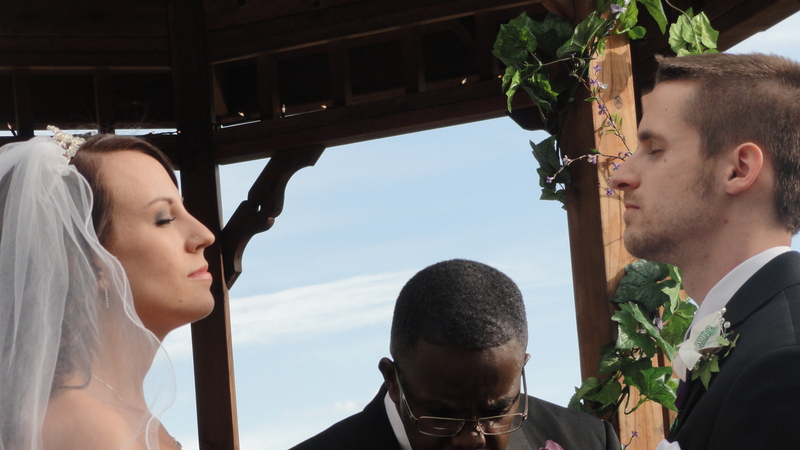 Stunned, I felt sure it was no accident that Sarah and David had chosen to get married on a day that celebrated harvest. 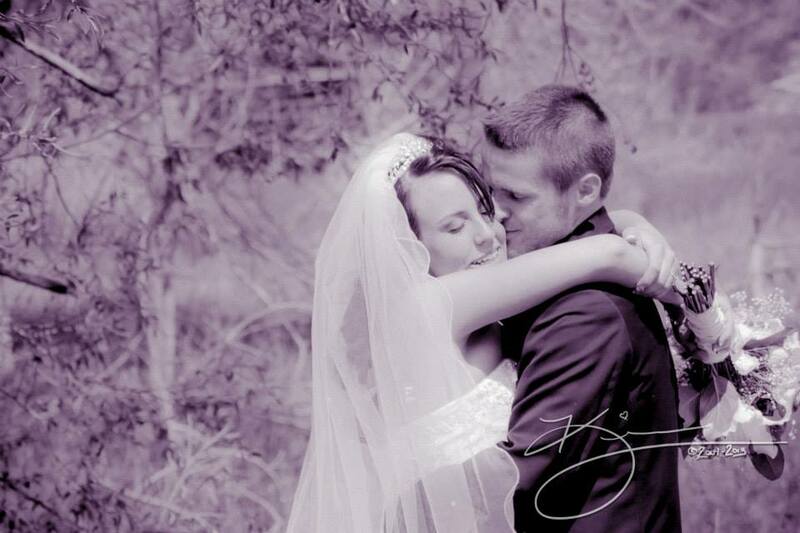 Their marriage seemed a harvest of all the choices they’d made to seek God in the hard knocks of fighting to adulthood. It seemed a promise to Jerry and me and Steve and Ronda that our prayers had been answered. May 19th, 2013 is Pentecost Sunday on the Christian liturgical calendar. Pentecost Sunday is the Christian celebration of the day the Holy Spirit came to followers of Jesus. It manifested in a wind that blew through the room and in tongues of fire upon those gathered. That day 3,000 people believed for the first time Jesus was the Son of God, Savior of the world. For Christians, Pentecost is a reminder of God’s plans, movement, and empowerment. It celebrates the birth of the Christian church. But there’s more! The Day of Pentecost is related to the Jewish celebration of Shavuot. Celebrated on the fiftieth day after Passover, Shavuot is traditionally a joyous time for expressing thankfulness to the Lord for the blessing of the first fruits of the summer harvest. 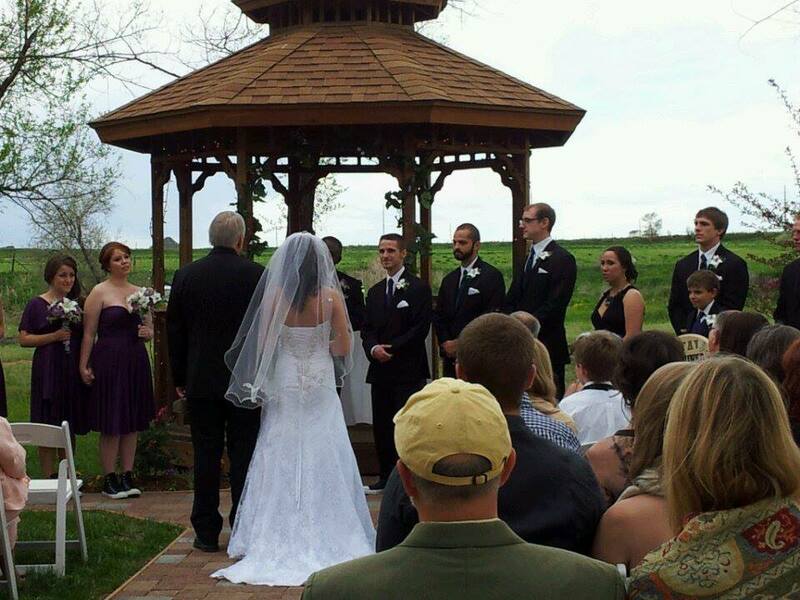 On May 19th, Sarah and David reaped an abundant harvest. They harvested the bounty grown from the seeds of parents who prayed their children would follow Jesus and find a spouse who did the same. They reaped a harvest from their own prayer seeds when they asked the Lord for a mate who understood their hearts, who looked to God for life direction, and who wanted to serve others with His love. 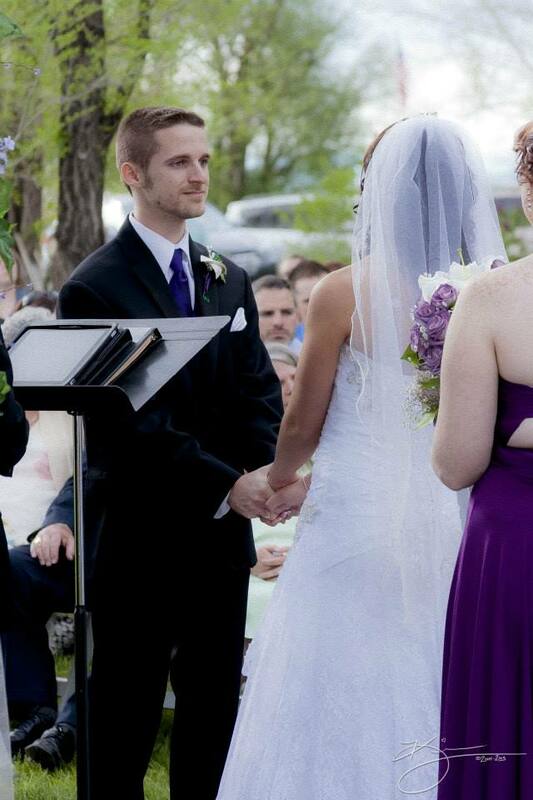 The marriage we celebrated on May 19th was God’s gift. It is the first fruits promise of all God will do in and through their relationship. It is a touchstone, a date of remembrance, an altar. It is a harvest of love, a celebration of the movement of His Spirit, and a joyous day of gratitude to the One who brought them together. A triple-braided cord is not easily broken. It started with a burst of laughter and ended with skipping. 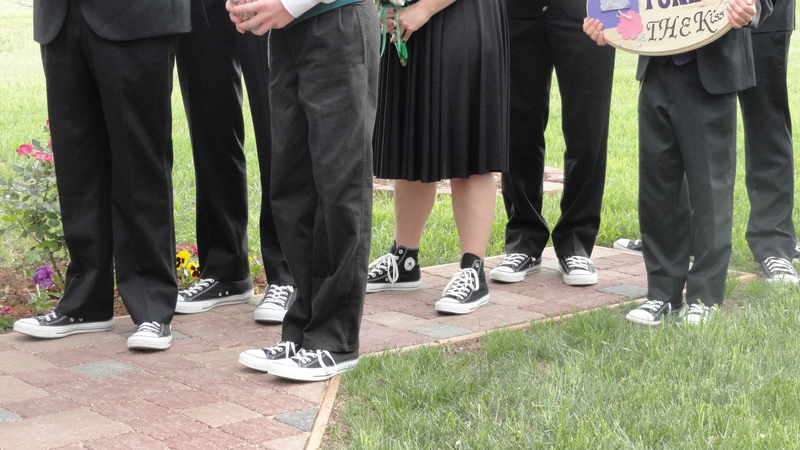 And somehow in the midst of funny stories, non-traditional music, and forgotten bouquets, we knew IT was there. And with so much love flooding the airspace JOY had to follow. It floated on the sound waves of their laughter. 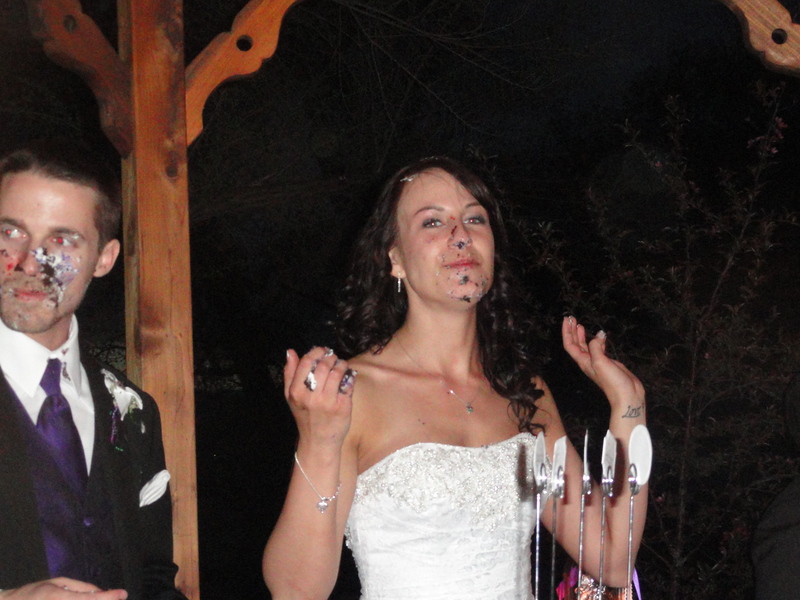 It bounced from the couple to the bridal party, onto the preacher, and then broke into a million tiny shimmering bubbles and covered us all. 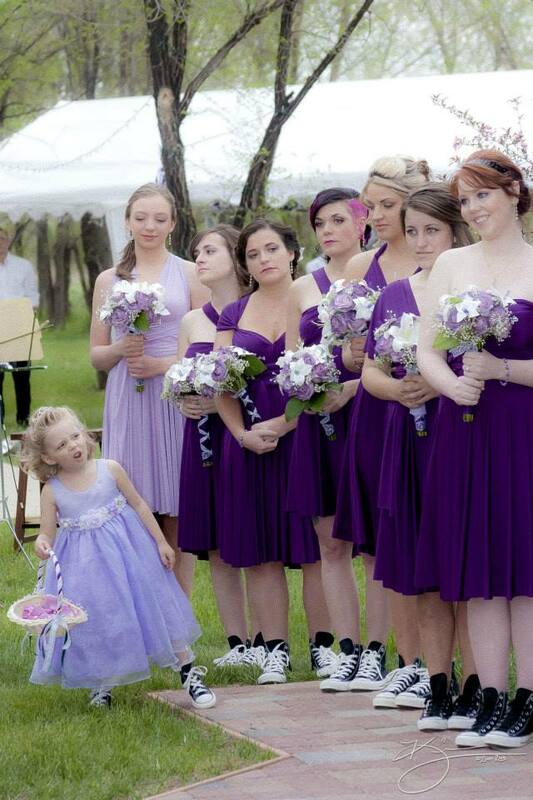 And bridesmaids who flitted down the sidewalk, pretty in purple and lavender. Finally everyone was in place. 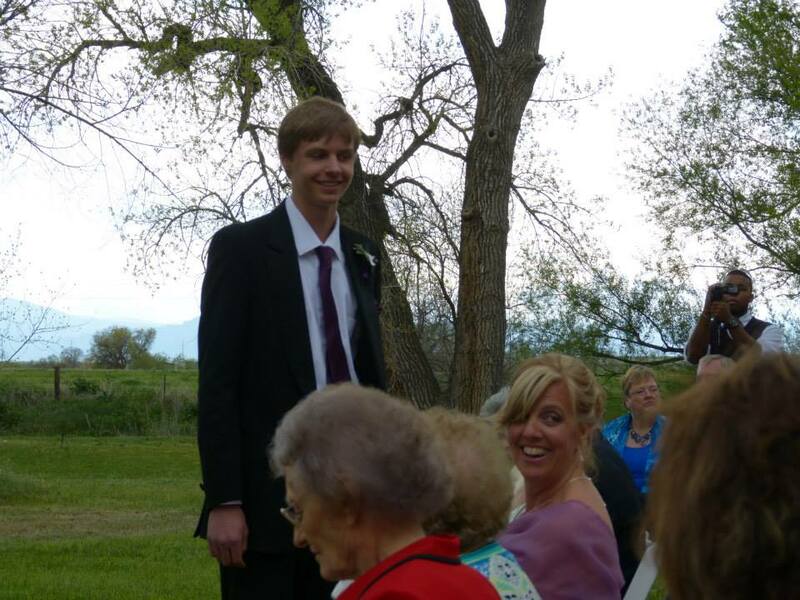 Suddenly the wedding coordinator nodded at me, and I remembered it was my job to stand, a silent announcement that the bride was soon to appear. I stood, family and friends stood. The big moment had come. When Sarah first stepped through the farmhouse door and onto the deck, David’s face grew tender. Then she stopped in her tracks and disappeared back into the house. “You worried, David?” someone yelled. 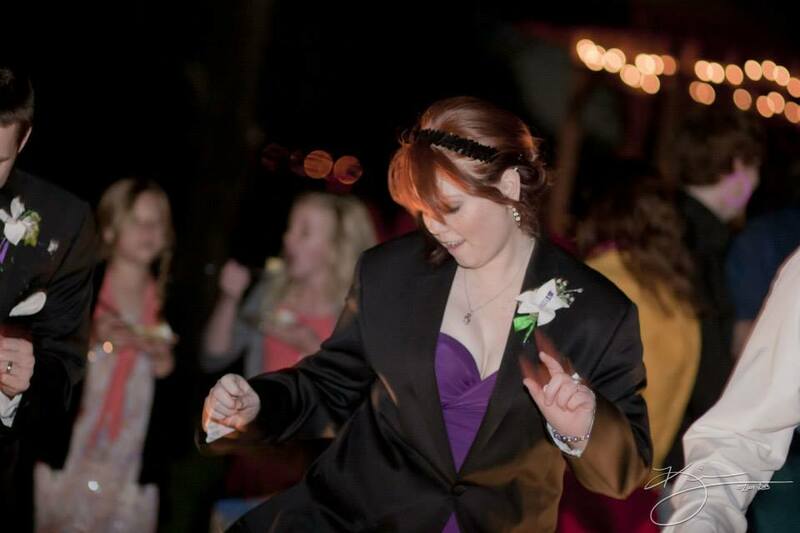 Sarah reappeared waving her forgotten bouquet. The audience roared. 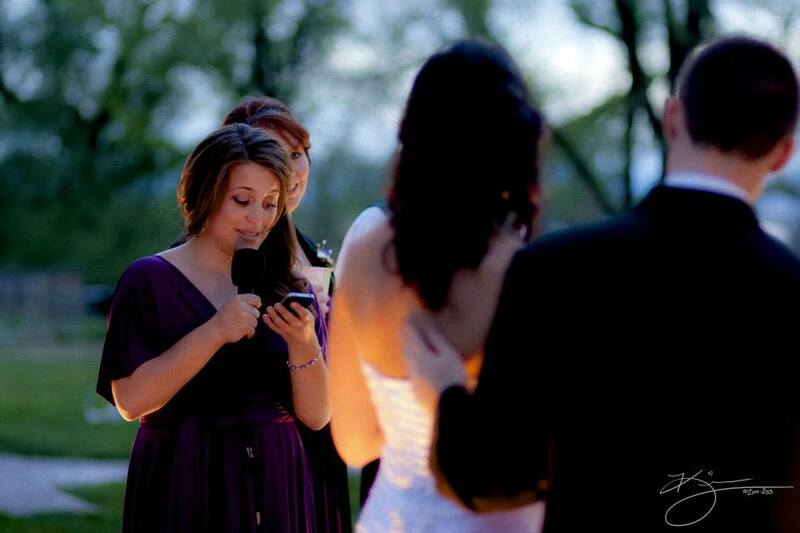 All around me people turned, facing backward, cell phones in the air, snapping pictures of the bride’s grand entrance. And my brother did. 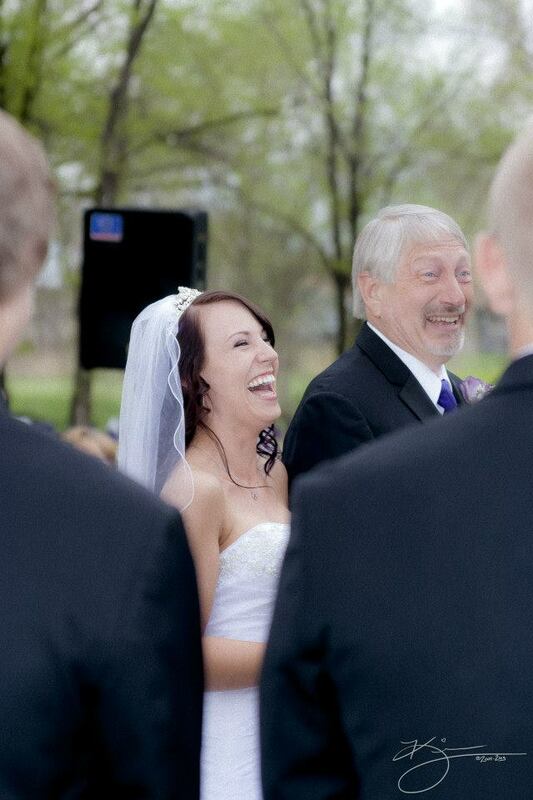 In fact, he took what may be my very favorite wedding picture. 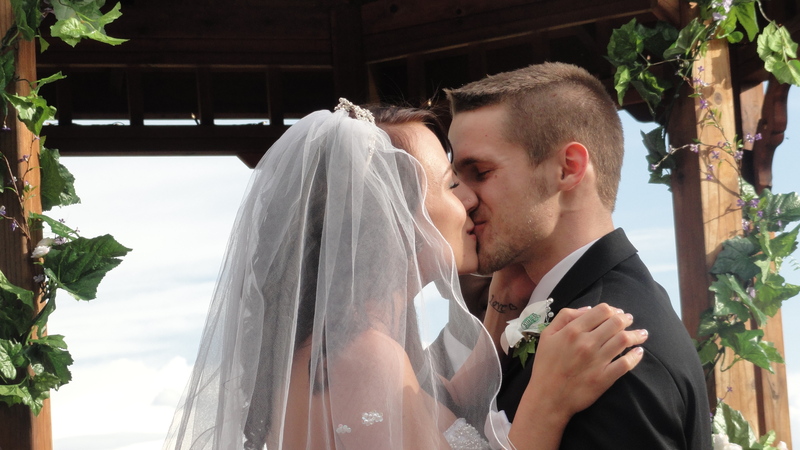 It’s at least the one that will be forever etched in my heart and memory as it shows how much my new son-in-law loves my girl. Jerry made more funny remarks, and soon everyone was laughing again. 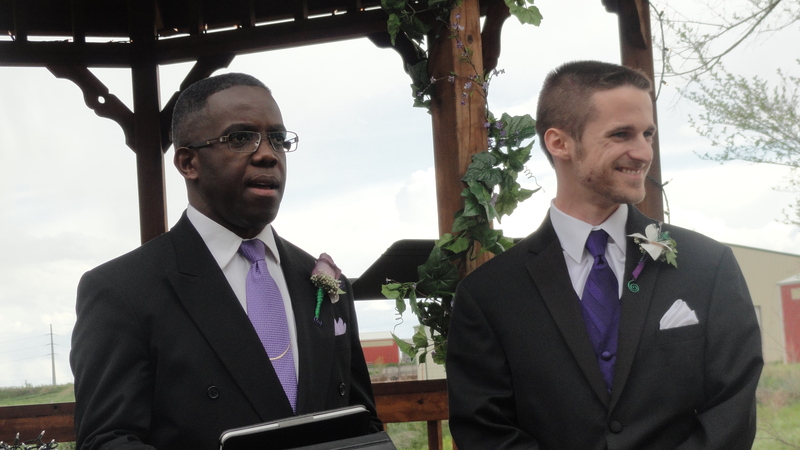 Then Jerry launched into this speech about how he could never give his girl away, but that he could welcome David into the family and whole-heartedly support the marriage union the kids were entering in. He talked about how he knew the Grundy parents felt the same. 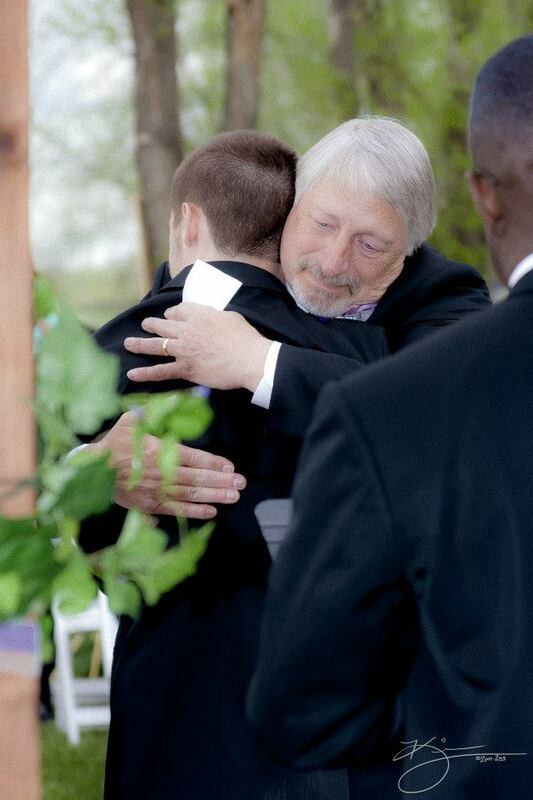 When he hugged his new son, the expression on both of their faces was priceless. There was hardly a dry eye in the place. 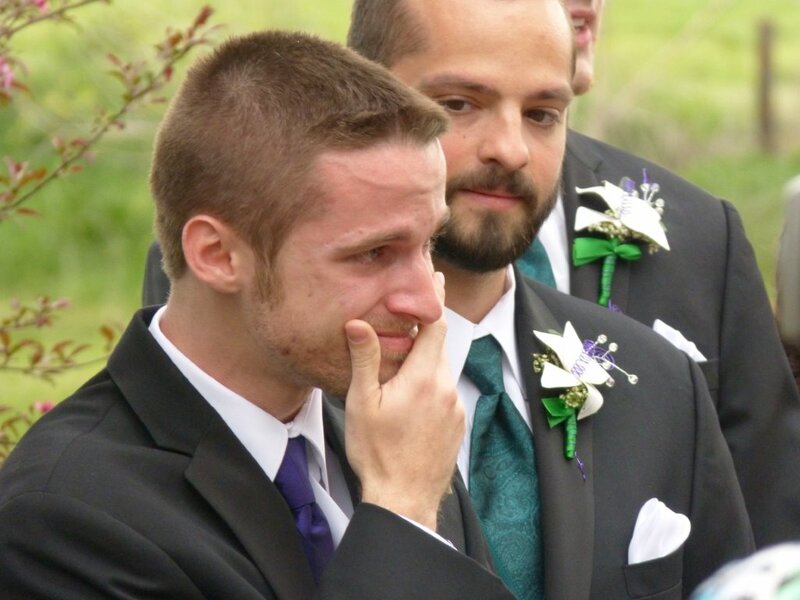 There was a lot of that teary thing in this wedding. 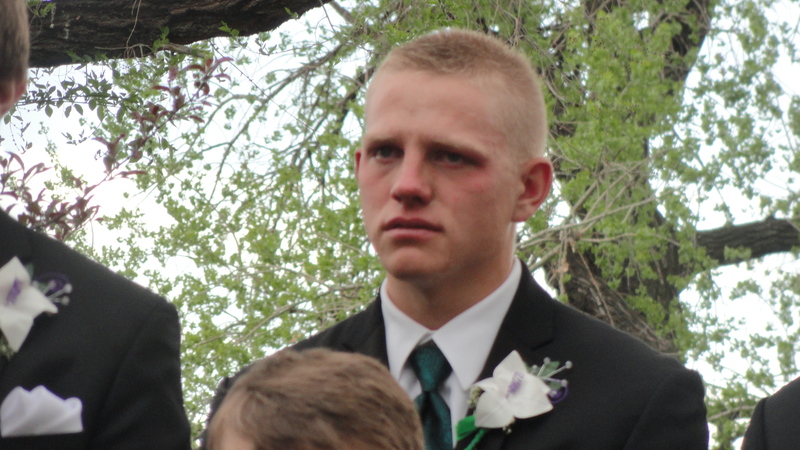 My tall, strong boys stood sniffling and wiping swollen eyes. It showed most on Stephen due to his light coloring, poor kid. David and Jerry were falling apart. 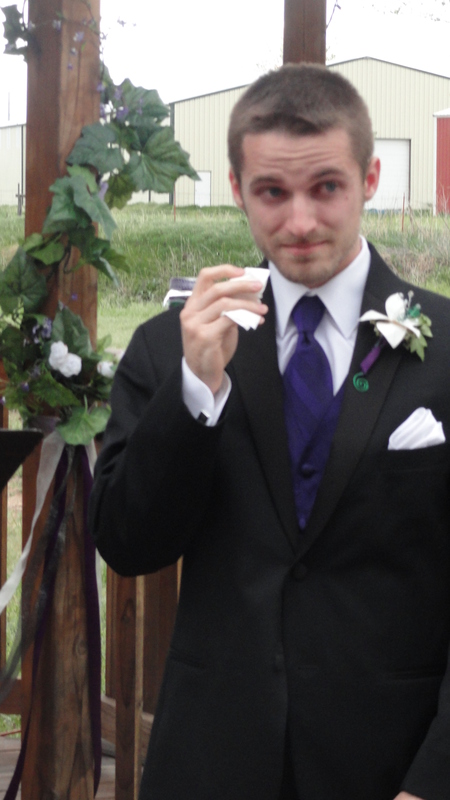 All I want to know is with all this crying why my nephew handed me a package of tissue as the wedding began? 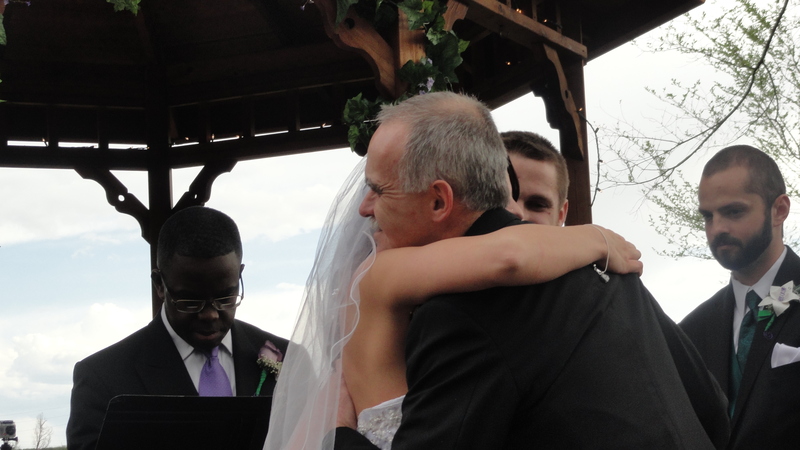 Neither did the sweet hug Sarah and her father-in-law to be shared. He then took us to the antics of Sarah’s daddy back in the days before I tamed him, and the audience was set aright. 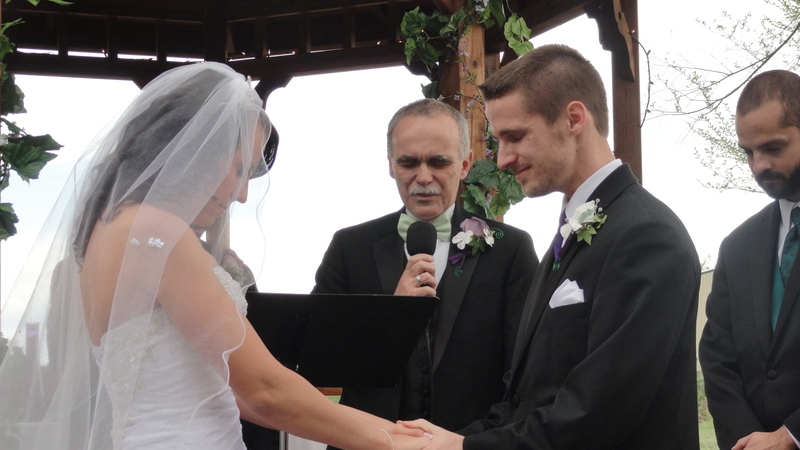 Of course when he turned to Scripture and quoted that the man and wife were naked and unashamed the giggles started again because my daughter shamelessly waggled her eyebrows at her unsuspecting groom! 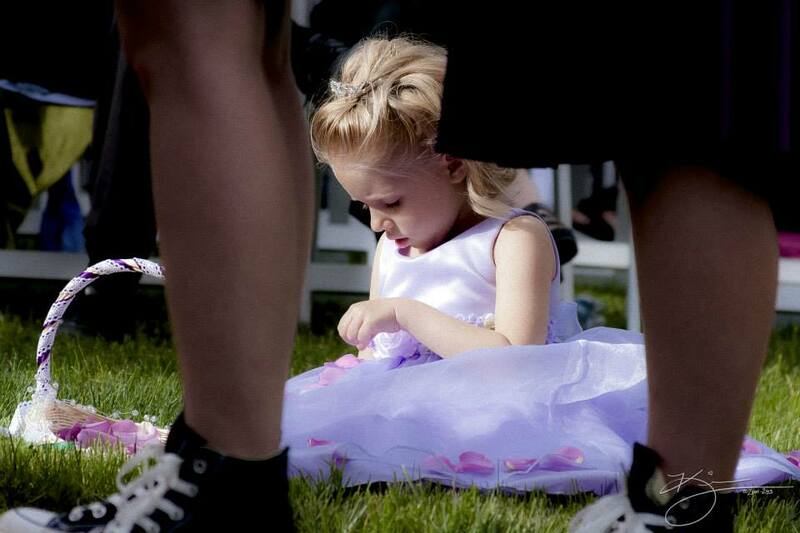 As the service continued the flower girl placed blossoms on her pretty lavender dress. 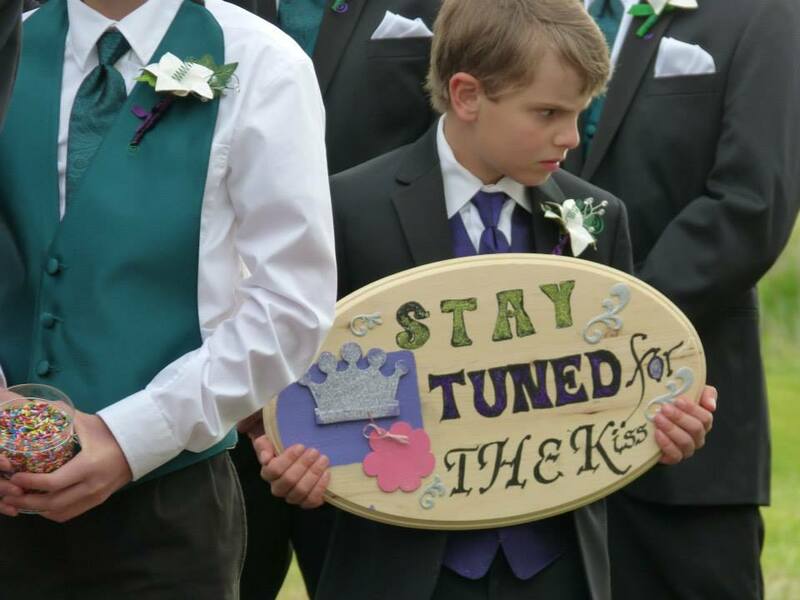 And the ring bearer stood firm, despite the burden of his heavy sign. 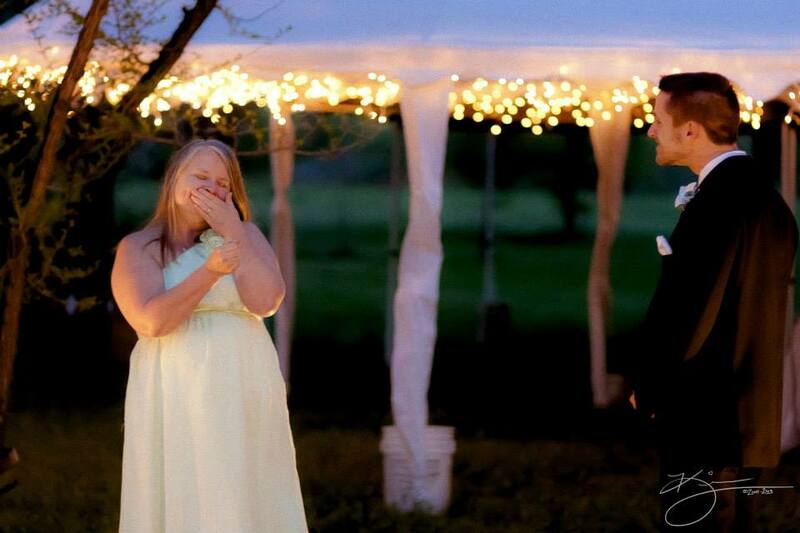 Family watched as a new life began for two young people very much in love. 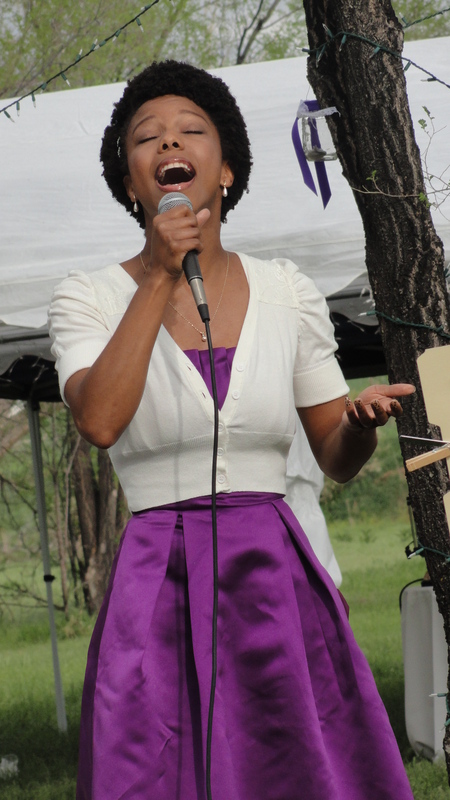 Her amazing voice enveloped the audience, the sun warmed us, and just then tiny sprinkles of rain dusted our cheeks. I grinned and looked at my daughter. Her eyes were closed and her face aglow. One of her favorite things is feeling a little rain in sunshine. I knew then she was soaking in the blessings, not worried for an instant about the droplets, just receiving them as a gift. As they shared their hearts it was obvious they each entered into the experience, allowing the other person’s words and love penetrate past the day, the crowded lawn, the brief moment. 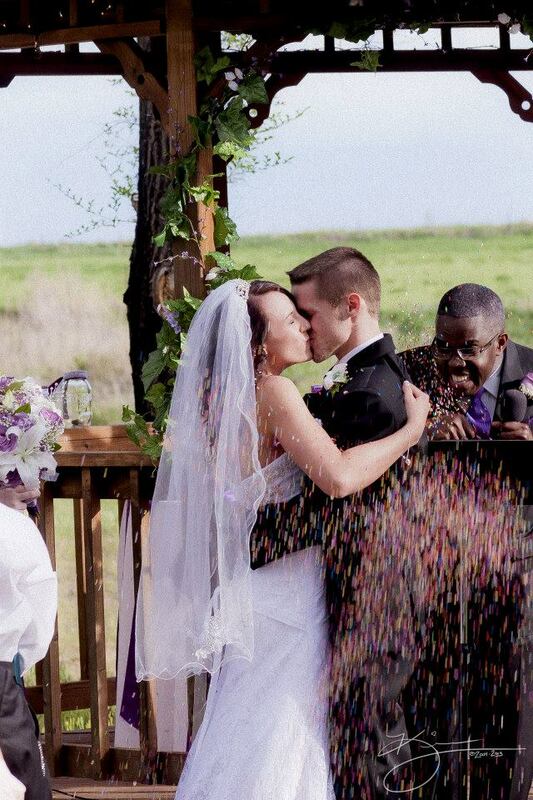 They welcomed the declarations to settle deep inside, treasured, alive for eternity. Then they exchanged their rings. Then they stepped back to grasp decanters of sand. 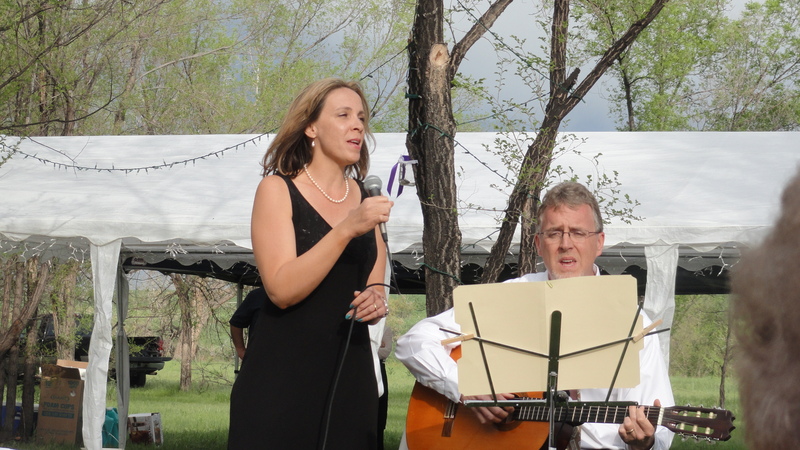 As my brother, Curtis, and his wife, Anne, sang, “I Will be There,” David and Sarah blended their lives and talents into a work of art. and pronounced them man and wife. There was a brief nod to the whole Disney princess thing when Sarah and David gave the prince and princess wave. 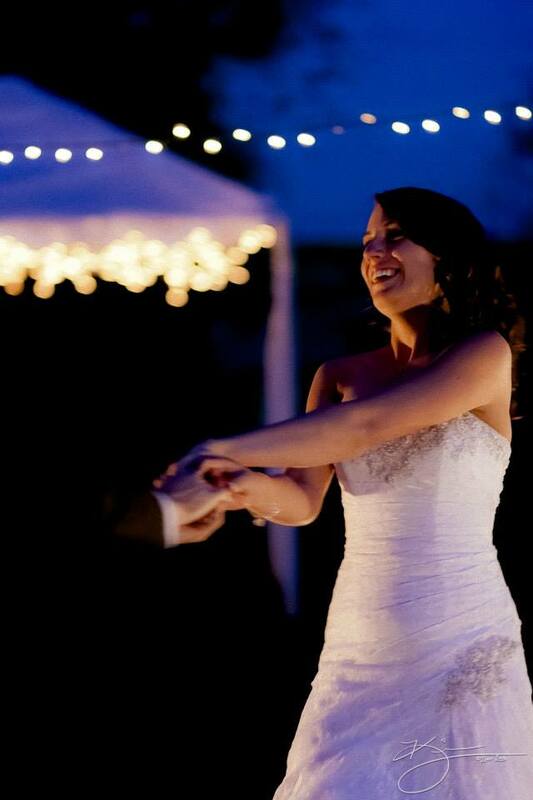 Then hearts full, we celebrated with the Mr. and Mrs. Grundy as they skipped down the sidewalk to “Come Dance With me. And THEN it was time for the party to begin! 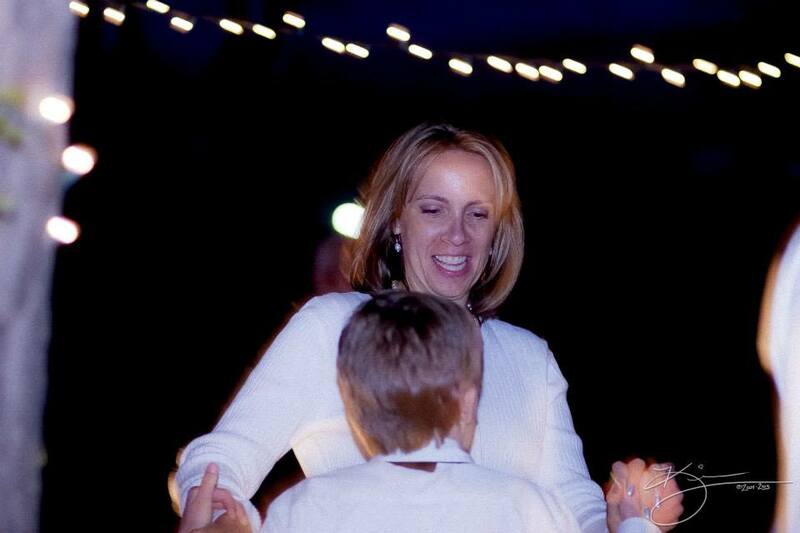 Tune in next time to dance under the stars! Sunday started early with a Safeway run. 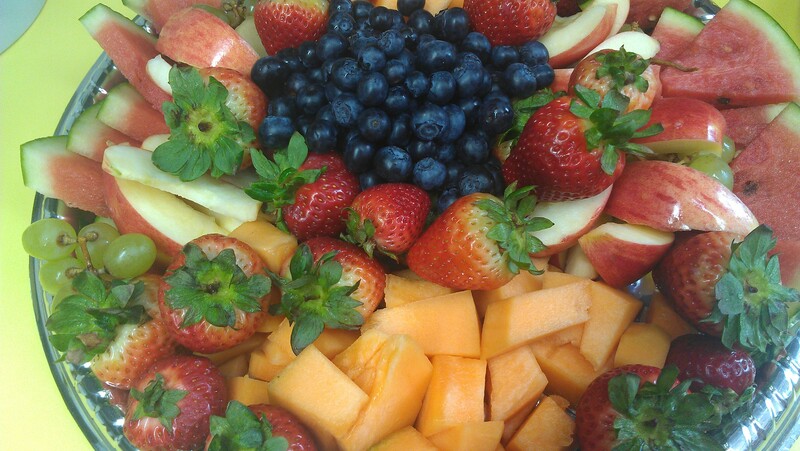 I wanted to entice Sarah and her bridesmaids to EAT as they prepared for the big day, so I put together a platter of fruit as well as some meats and cheeses to send to the venue with our fabulous wedding coordinator, Niki, who took time out from their family ministry to take care of us! I wanted light, refreshing food that would feel healthy and not heavy. My new healthy eating habits made this even more important to me. At the store I even splurged on blueberries, which are Sarah’s favorite. I never did ask her if she ate any. Those girls were spoiled because Niki took treats to them as well. 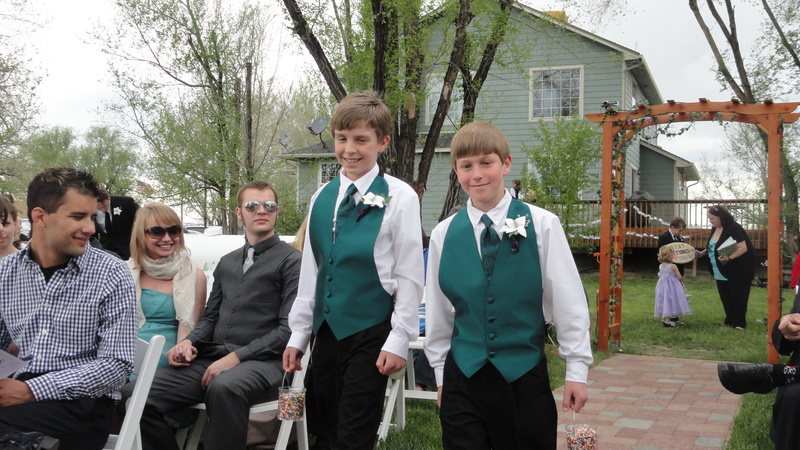 AND she dropped off two crockpots of food at my house so my boys could enjoy a big lunch since the guys were not to arrive at the venue until afternoon. Then it was off to get my hair done. 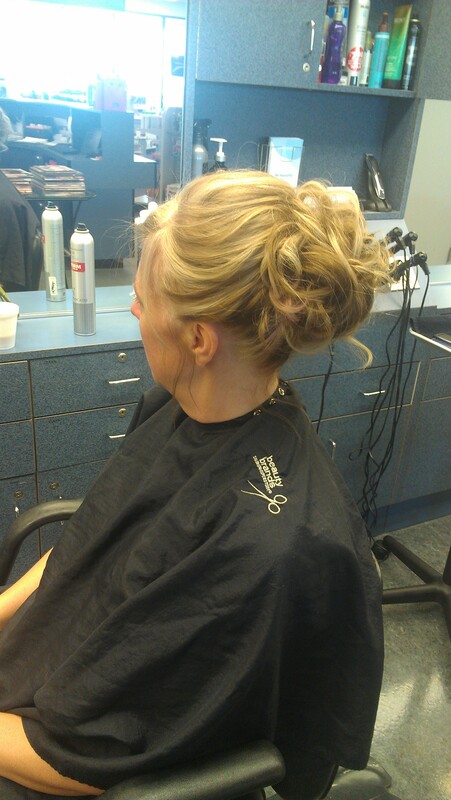 My cosmetologist daughter sent me with four photos of updos so the stylist could capture exactly the look we wanted, and the stylist did just that. There was another amazing God moment. The stylist charged only what the salon required, saying she wanted to give Sarah and me a gift. 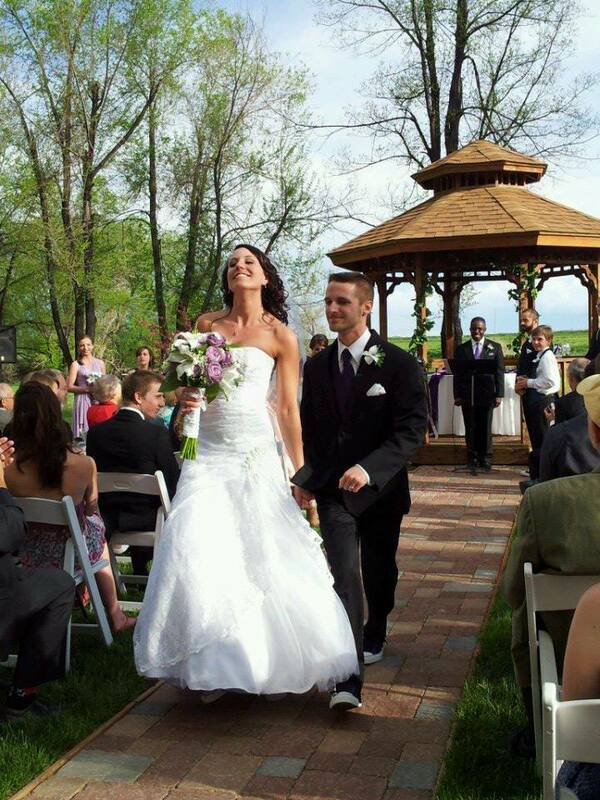 Every time I turned around through this wedding week God provided blessing and provision. 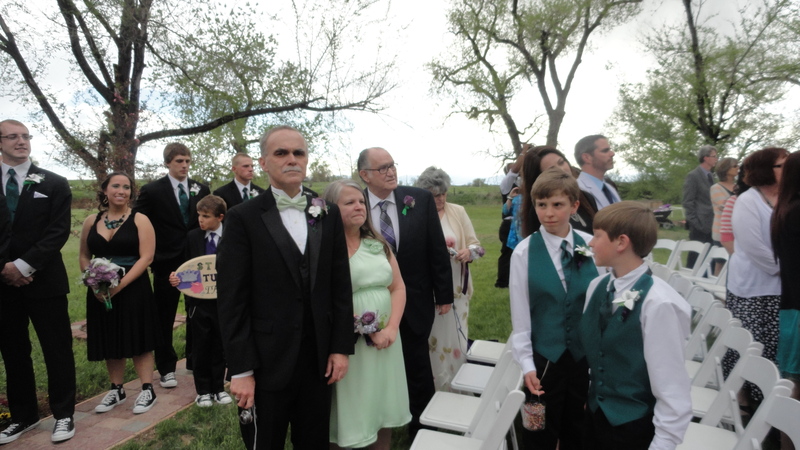 The whole wedding experience was clearly an example of the love of a generous community. At the venue Sarah’s talented co-workers dressed up her bridesmaids with amazing hairstyles while friends and family prepared the venue. 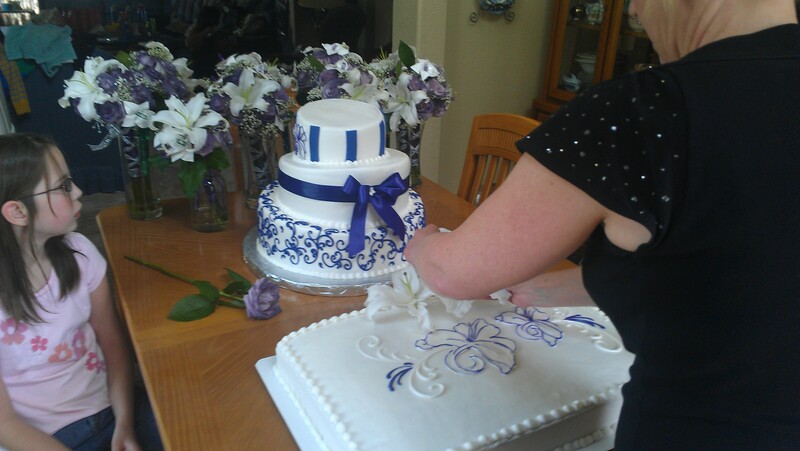 At almost every wedding in our circle there has been a bit of a cake fiasco that had to be rescued, so our wedding planner, Maggie, begged us to order from her favorite bakery instead of having a friend do the cake. Would you believe that one of the cakes was delivered with a slight mishap? I’ve started calling our friend Monique the cake whisperer because she rescued yet another cake at Sarah and David’s wedding, despite the professional delivery. Monique also blessed Sarah and David creating all the floral arrangements for this event. Sarah and David and their friends made over 600 duct tape flowers, which Monique incorporated along with fresh flowers. 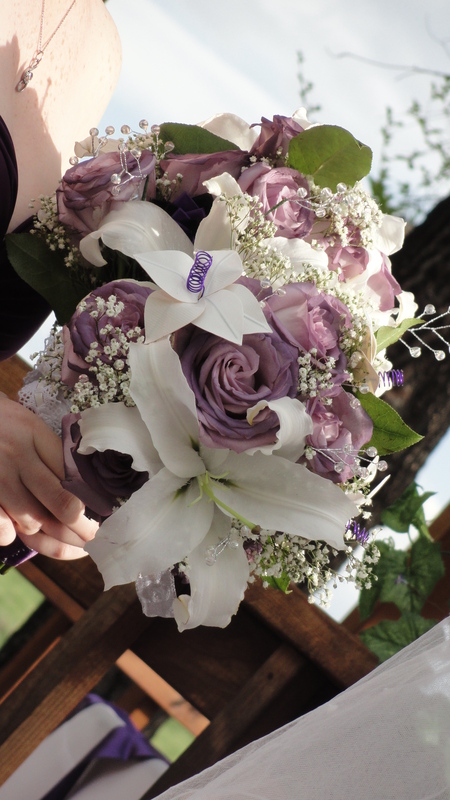 Sarah’s bouquet actually included roses made for Sarah by David. Her first bouquet from him when they were dating included duck tape roses. Monique also used the duct tape flowers in the boutonnieres and corsages. 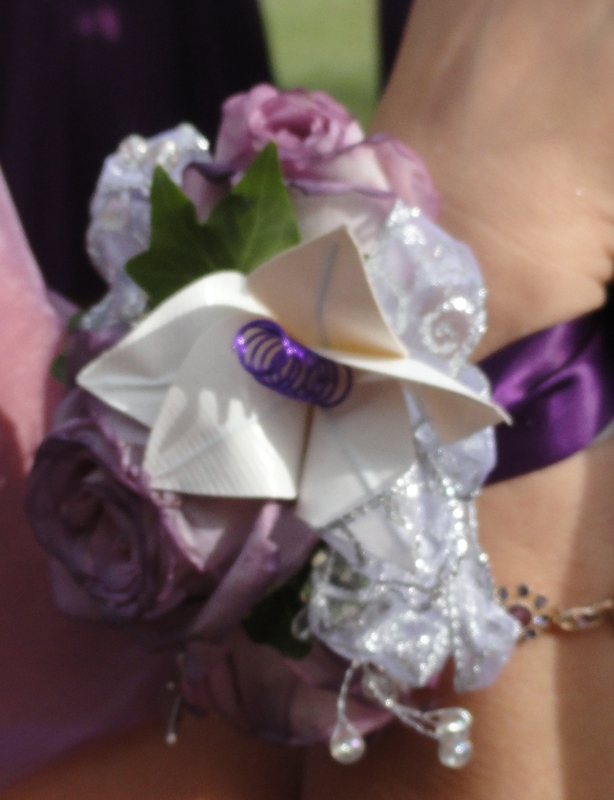 This is my corsage. 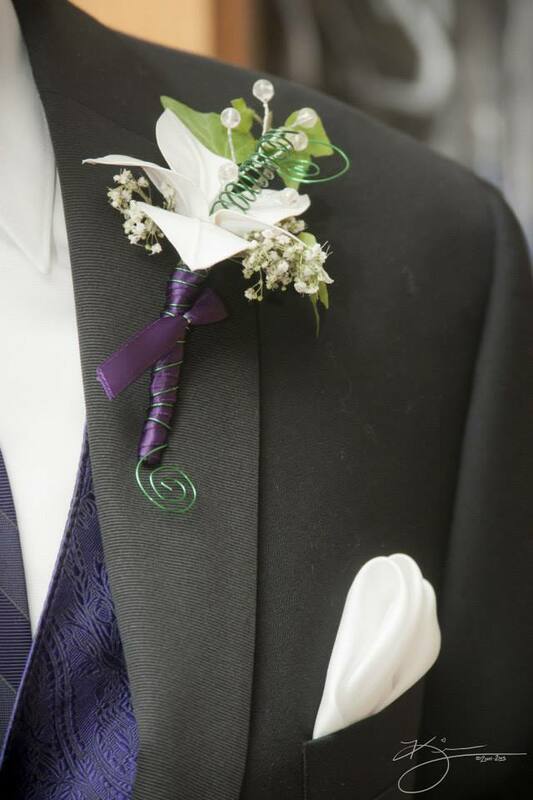 A fun aside is that there is a pride and prejudice charm in it to symbolize Sarah find the man she says is, “even better than Mr. Darcy.” Ronda’s mother corsage had a special charm, too, which symbolized her open heart in welcoming Sarah to the family. 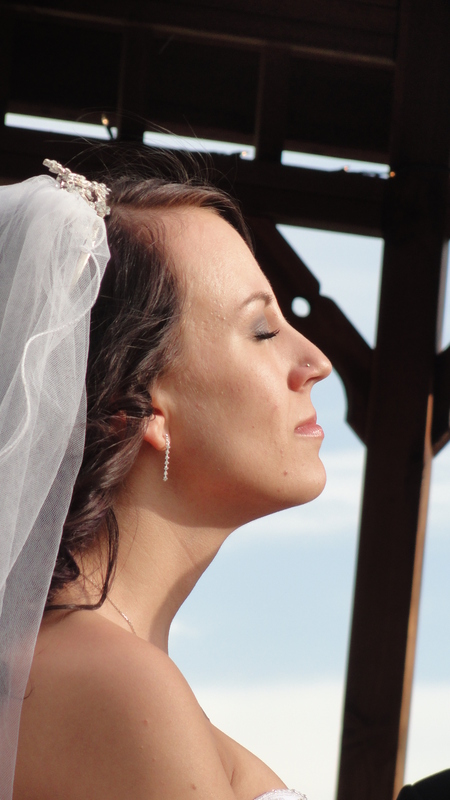 Sarah’s something old was her veil. 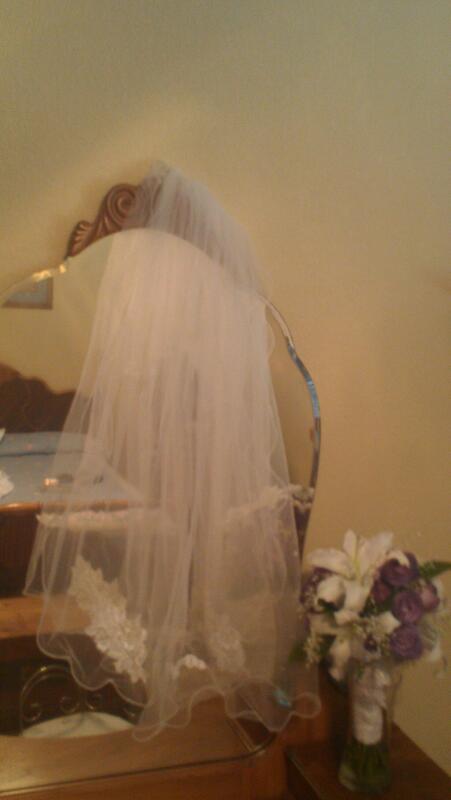 A friend and I worked for some time taking apart my wedding veil and recreating it for Sarah. 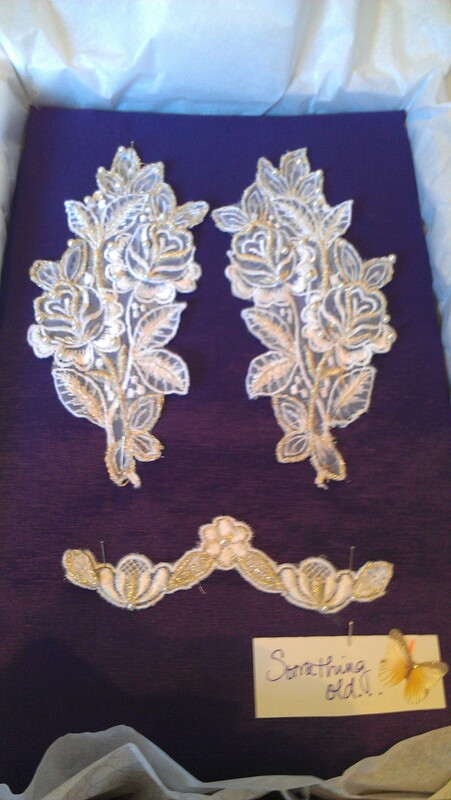 I embroidered silver threads into the appliques we took from my wedding hat. 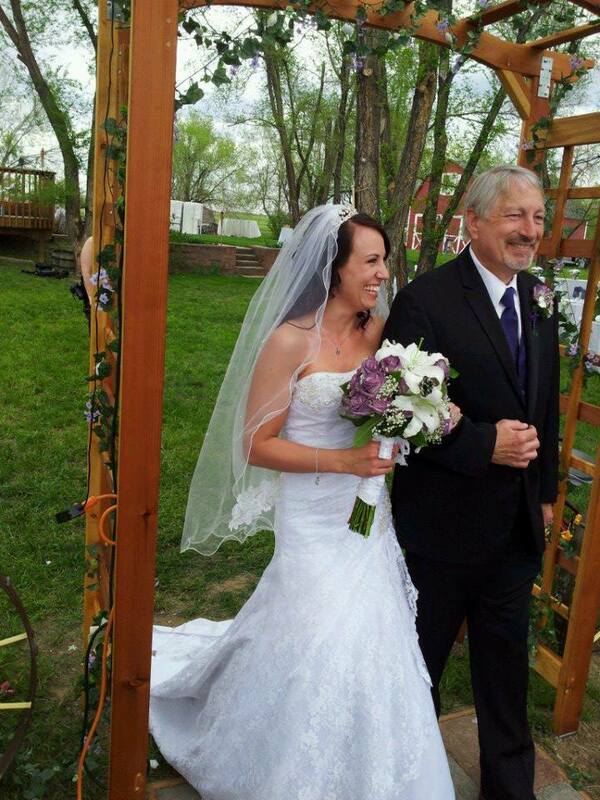 My talented friend Kordee arranged them across the tail of the veil, scattered sequins and pearls across the veil, and reassembled the veil on a comb for Sarah. 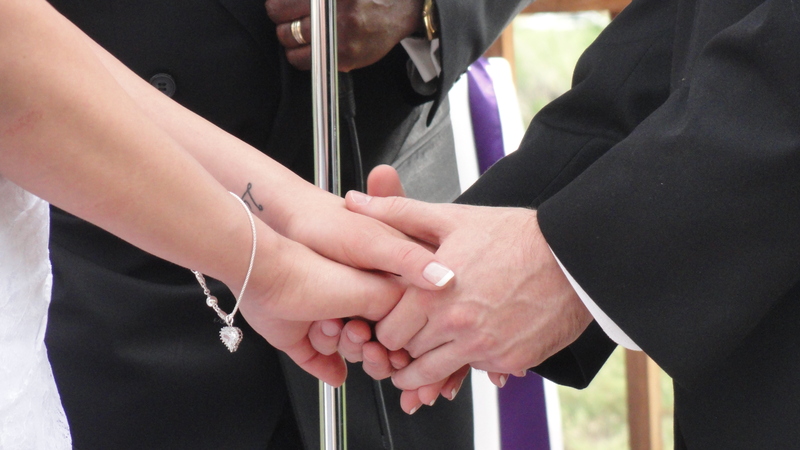 Sarah also wore a lovely heart charm for her something borrowed. 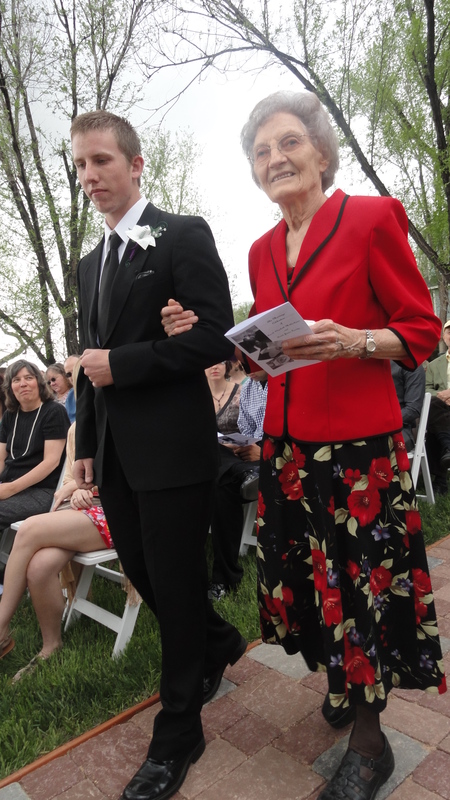 It was loaned to her by her honorary grandmother, Bernice. 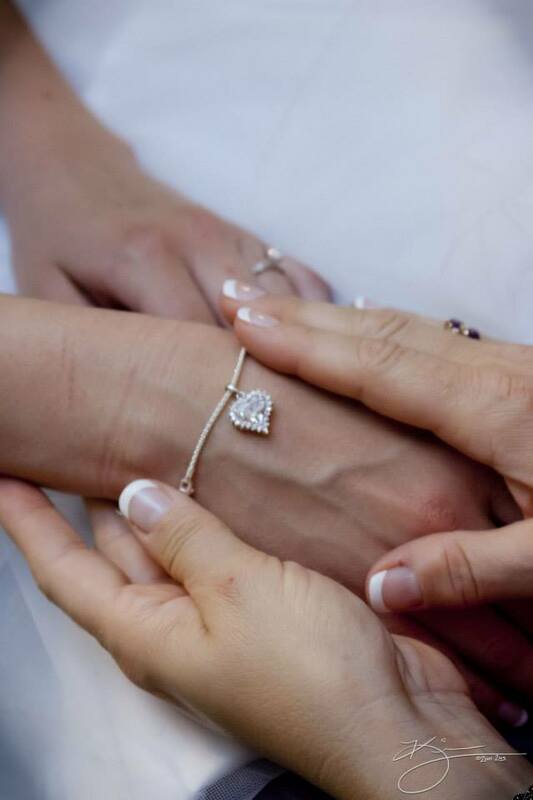 Her something new was a beautiful necklace from David, and her something blue was a piece of her dad’s blue T-shirt, tucked in her gown next to her heart. When her daddy heard this idea, he immediately pulled out a blue T-shirt from his honeymoon. 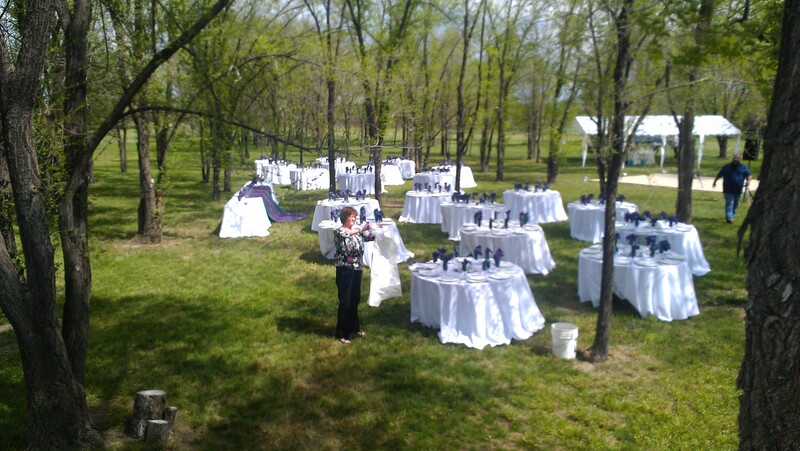 As Sarah dressed her matron of honor and maid of honor joined mom in helping her make final preparations. 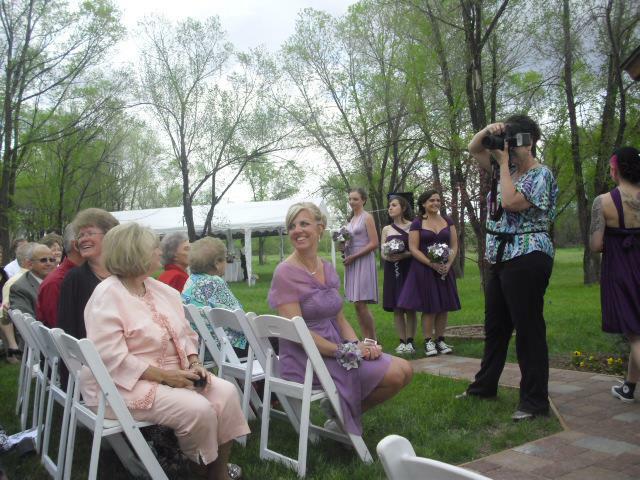 A fun aside is that two of mom’s bridesmaids from 1989 were also in the room, helping mom and Sarah dress. Sarah and David chose to do a “reveal” so they saw each other before the wedding, all dressed up. They shared a private moment together, then took lots of pictures! 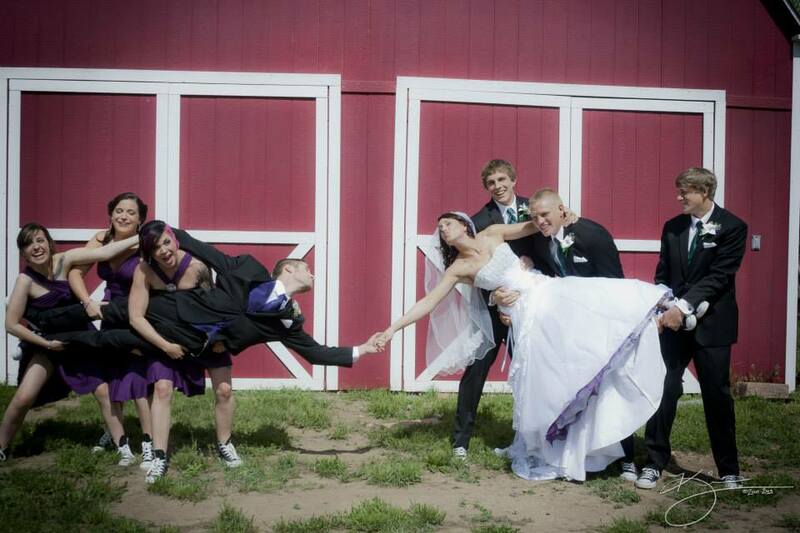 Sarah and David’s siblings got into the posing fun by supposedly pulling the couple apart in front of the big red barn. 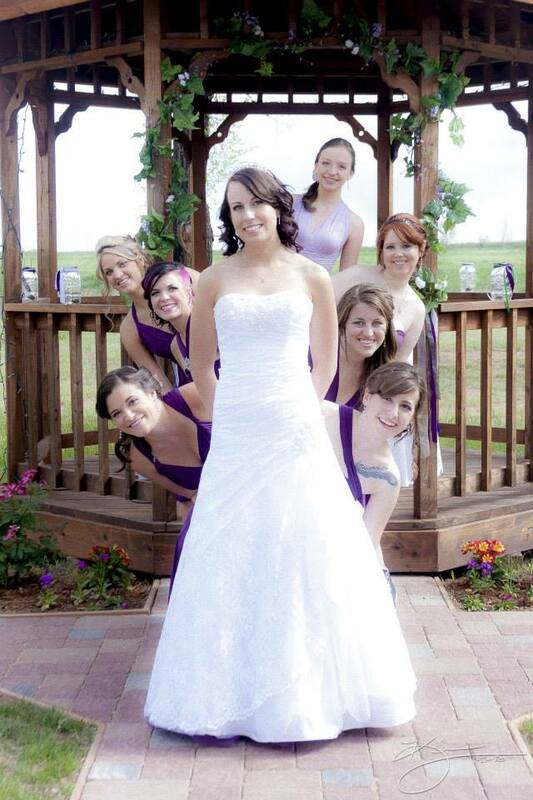 And the bridal party did all kinds of clever poses, too. 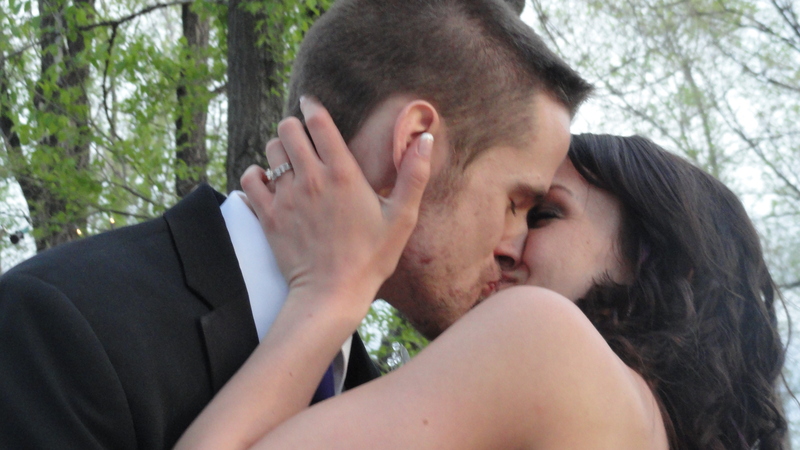 And throughout all the picture taking, David and Sarah often found time to touch noses, give hugs, and kiss! Soon it was time for everyone to get into their places. 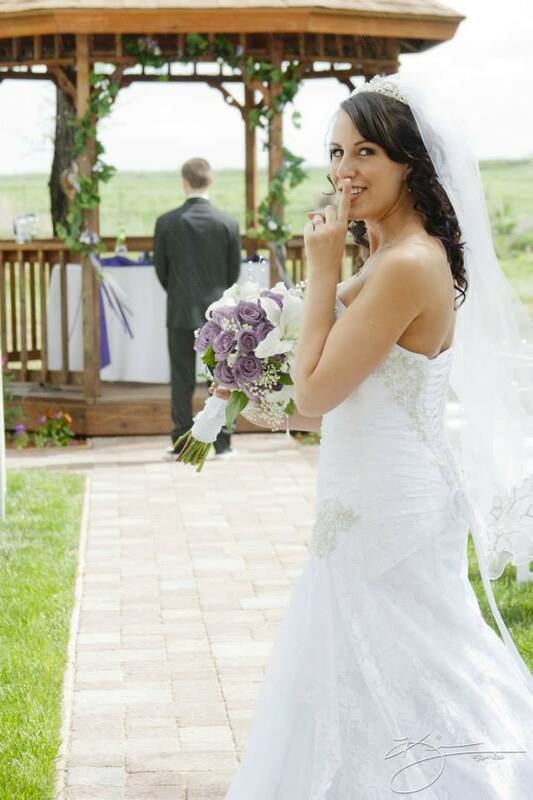 Sarah waited on the interior balcony of the farmhouse and peeked out the window watching the guests arrive. The ceremony would soon begin!